Cooking for two people is always a challenge. When I crave for a dish I’ve made before, often times it’s something I made for a crowd, and sometimes it’s just too much to do for a simple weekday dinner. 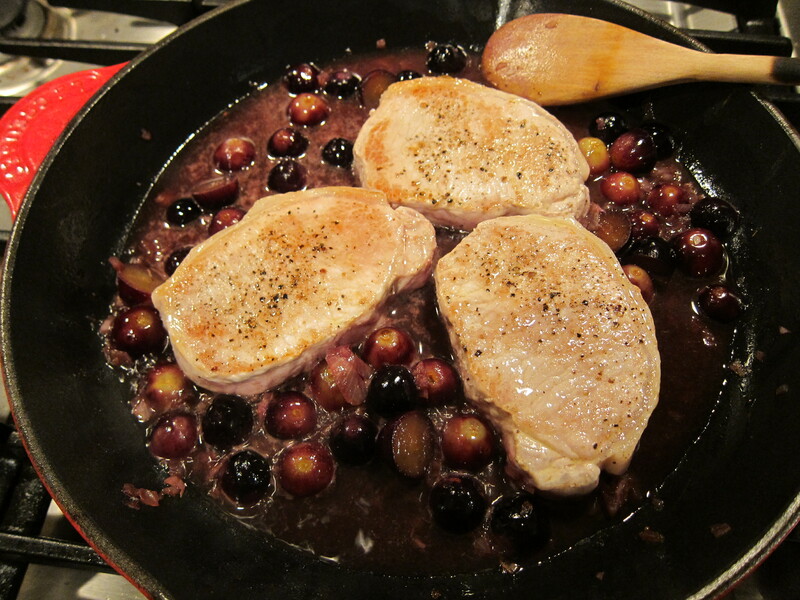 There was a great recipe for pork loin braised in black grapes that I remembered from a dinner party a while back, but I didn’t want to make the whole thing on a weekday. 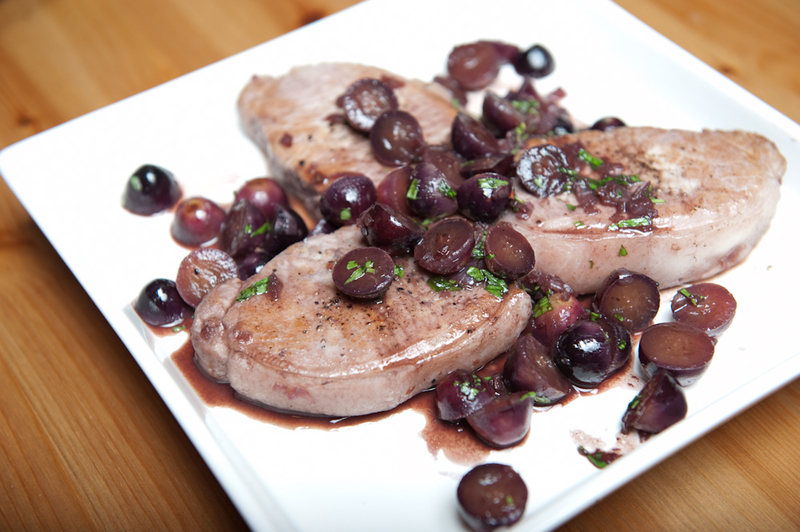 Fortunately I found this simple pork chop recipe made with grapes and tarragon. 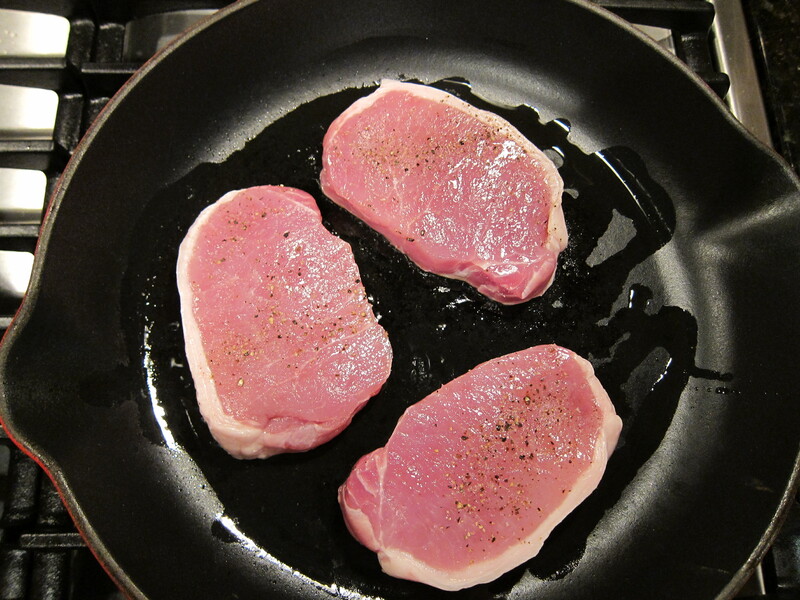 To make the pork chops, the chops are seasoned on both sides and seared for about 3 minutes on each side, 6 minutes total, until it’s almost cooked. 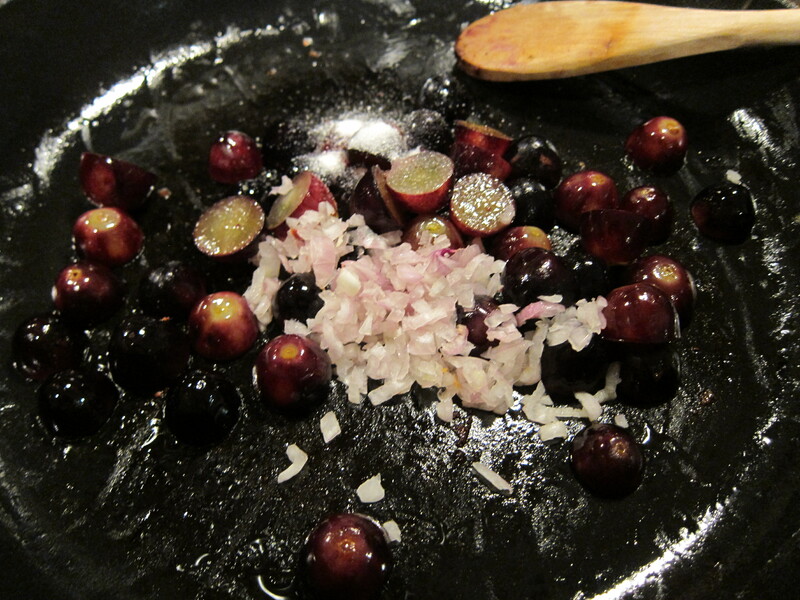 The chops are taken out, and grapes are added to the pan until lightly browned. 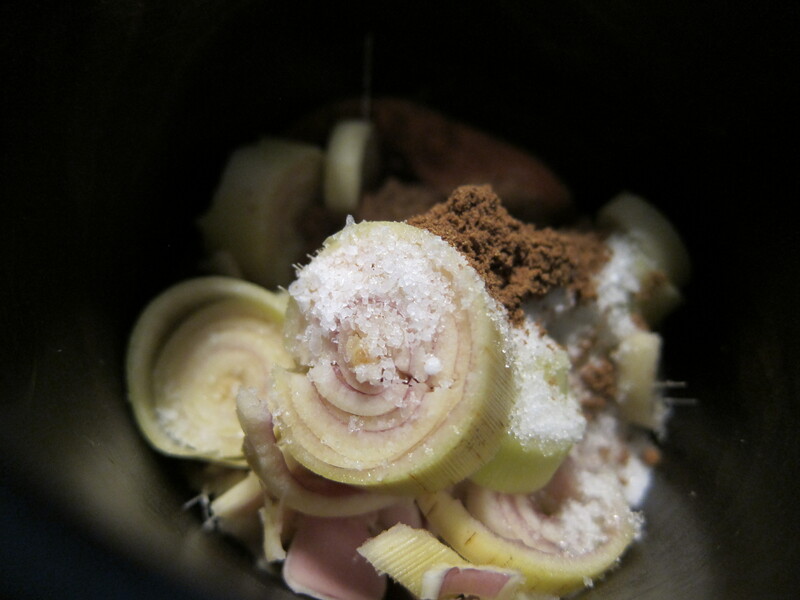 Then sugar and shallots are added and cooked. 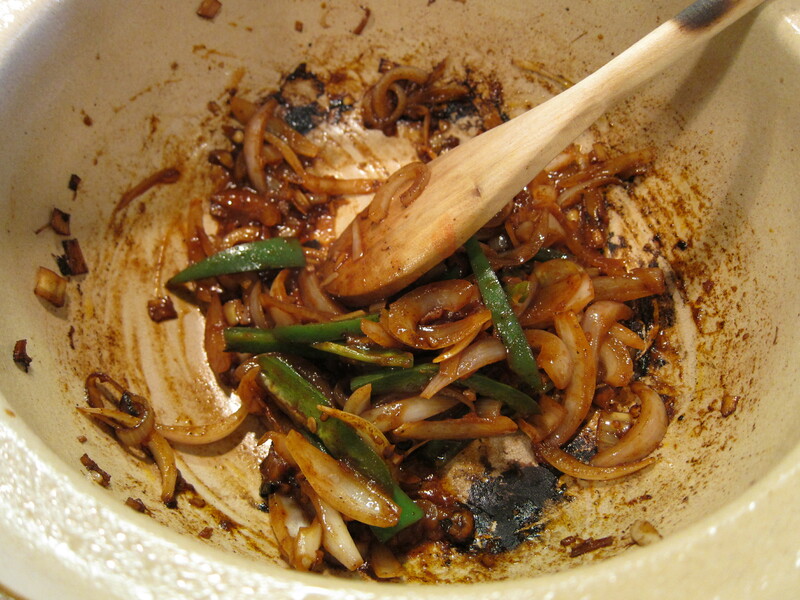 The pan is deglazed with vinegar, and wine and broth are added to the pan. 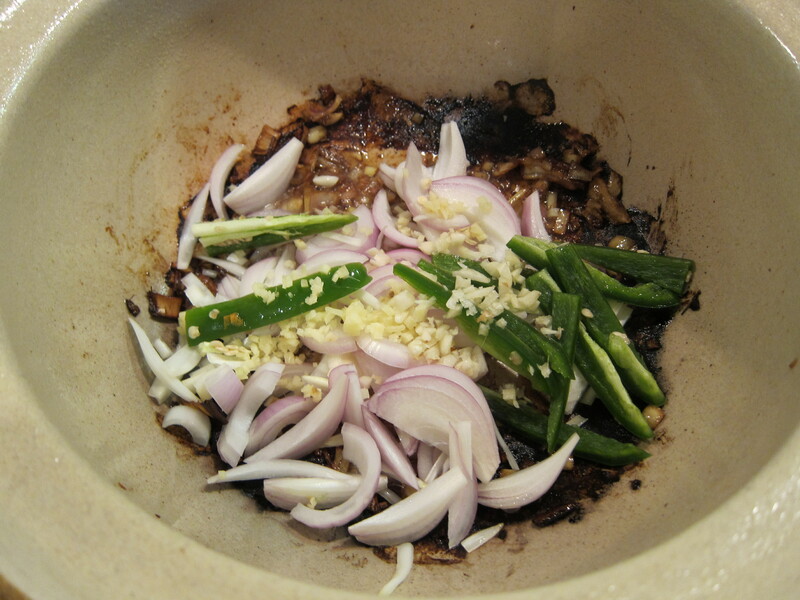 After the stock is reduced about half way, the pork chops are added back into the pan, and simmered until cooked through. The chops are removed and kept warm in the oven. 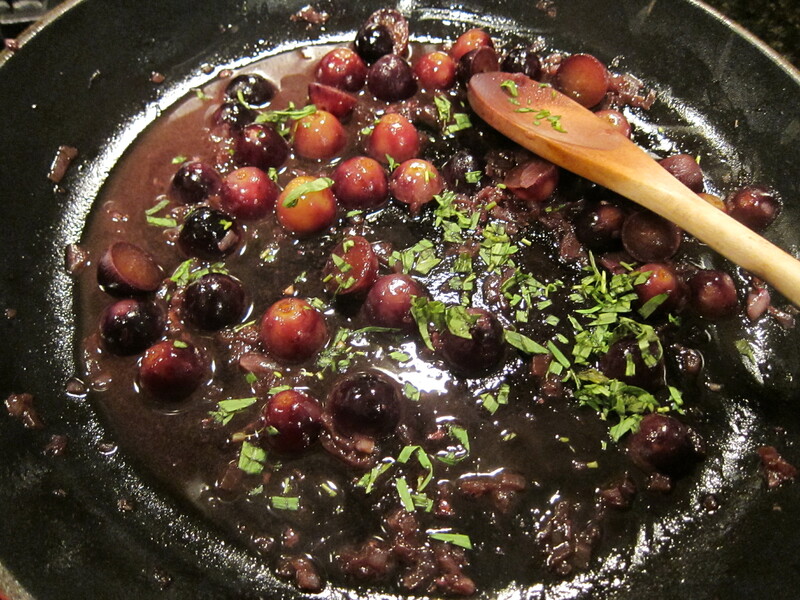 The grapes and the stock is cooked on high until thick and syrupy…and tarragon leaves are added. The sauce is spooned over the chops. 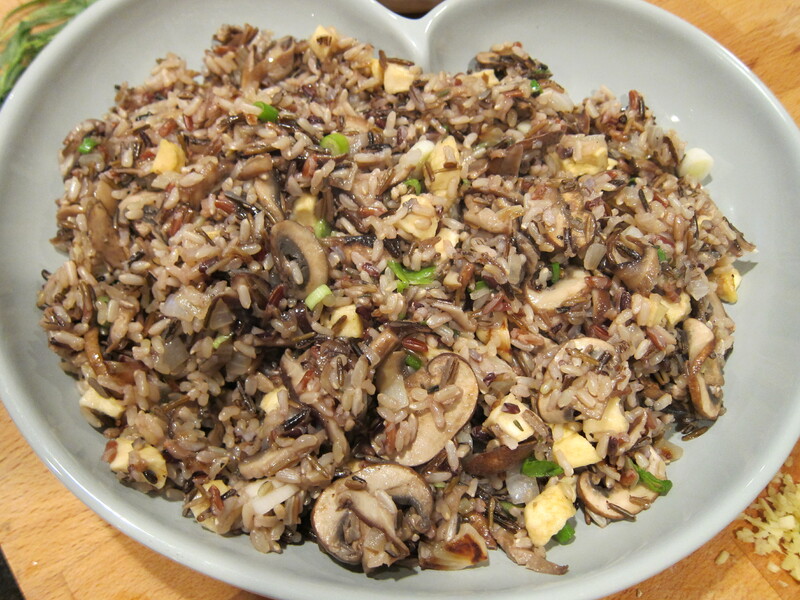 To go with the pork chops, I sautéed up some sliced shiitake and crimini mushrooms, and added them to cooked wild rice, dried apples, and chopped parsley. 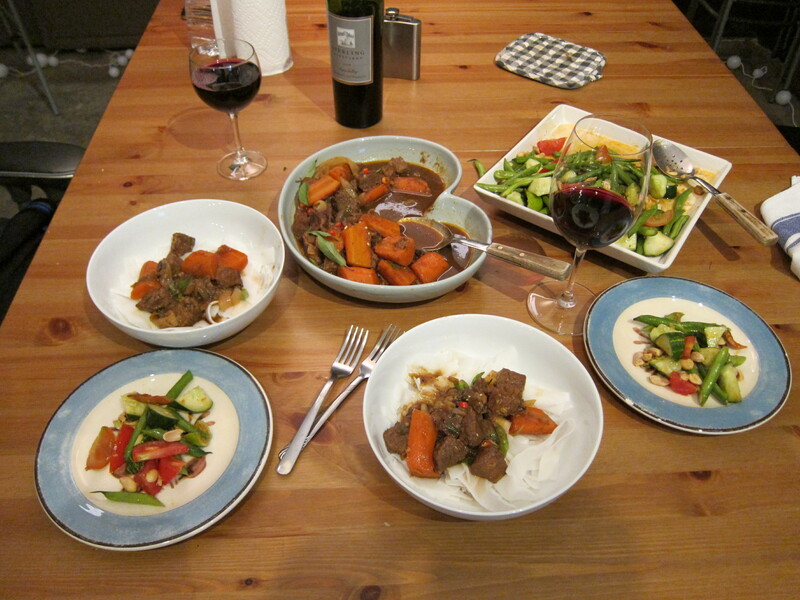 To complete the meal, I made ginger-lime carrots from a recipe by Richard Blais, the winner of Top Chef Allstars. 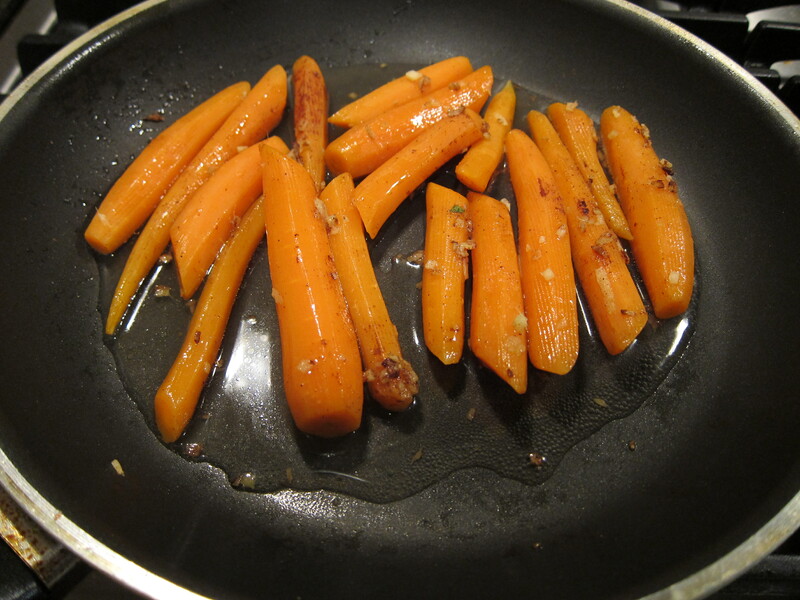 Carrots are blanched and then sauteed in a pan with ginger and cinnamon. 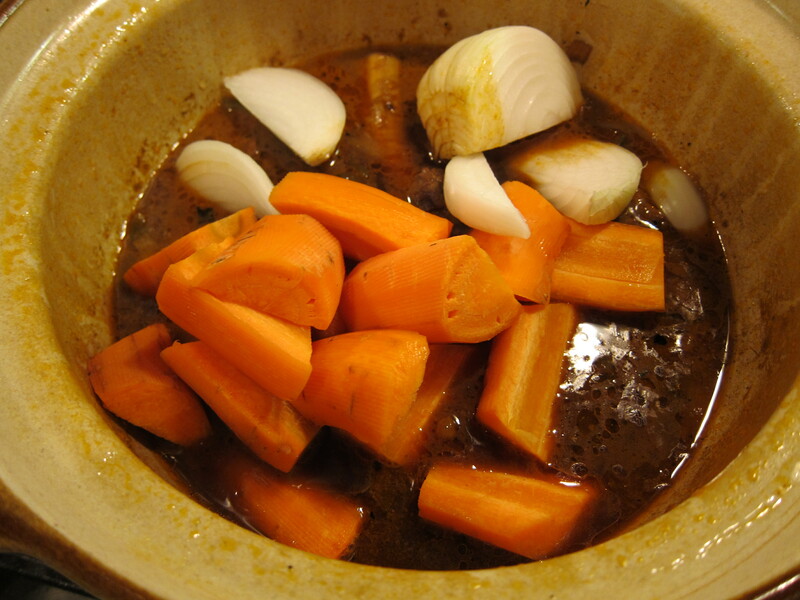 Broth is added and reduced by half. 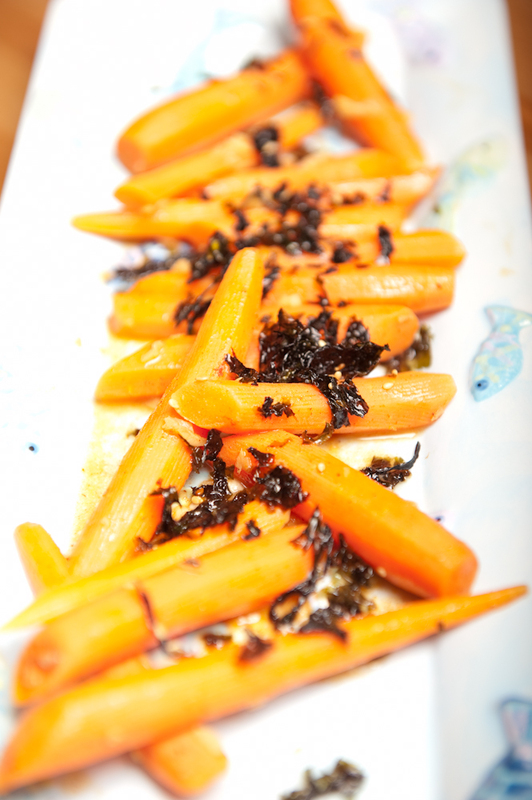 The dish is finished off with butter, lime juice, and sriracha, and after plating, seaweed flakes are sprinkled on top. 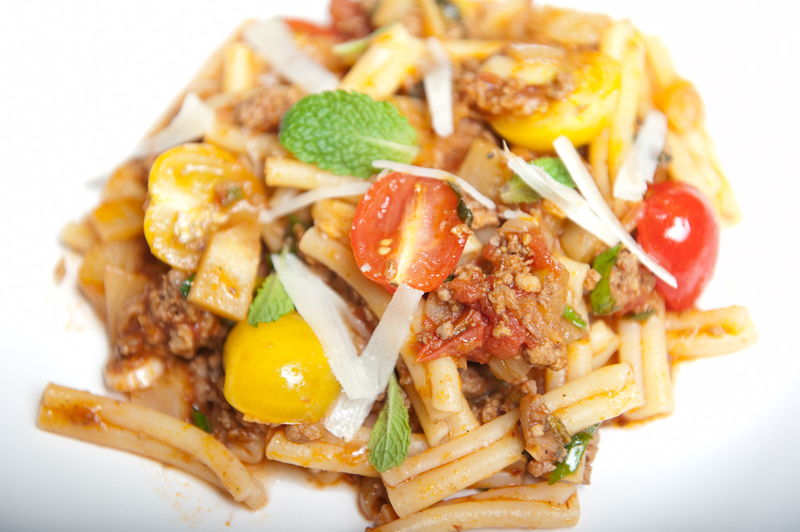 Strozzapreti is a type of Italian pasta, literally meaning “Priest Choker”. The background on this pasta is quite interesting, almost all negative towards the clergy. Some say it’s named after the fact that these pasta are so good that gluttonous Priests can’t help but choke themselves on it. 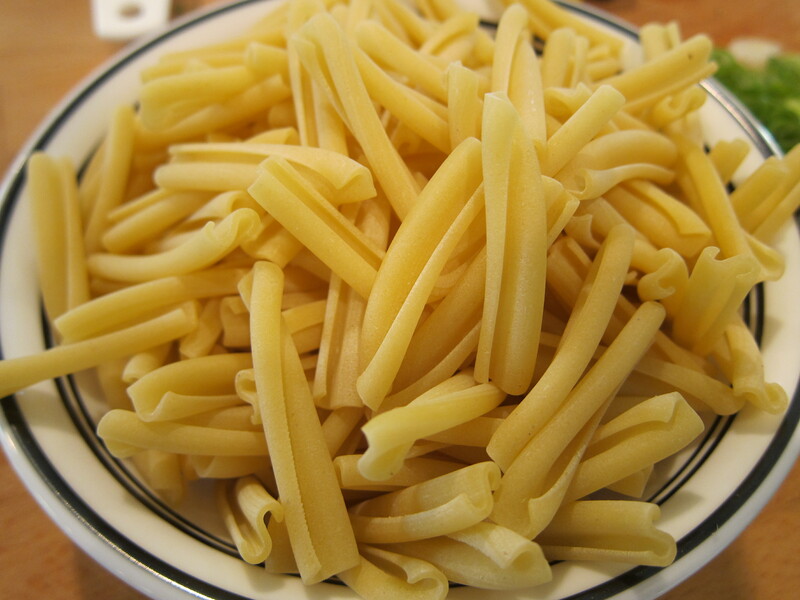 Another interpretation is that these pastas are used as partial payment for land renters, and the renters would be pissed off from the fact that their wives would have to make these pasta that they would wish that the Priests would choke on them. Food history is awesome. I came across a photo for this recipe from Food and Wine, and I was instantly drawn to it due to the fresh and bright colors from the pasta. It’s definitely one of those recipes that you start at noon and eat for dinner. 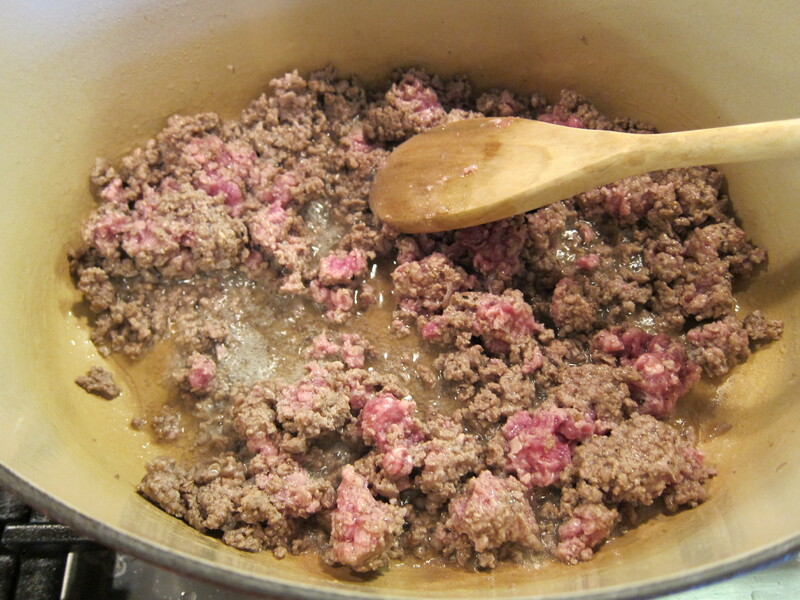 First some ground lamb is cooked until brown in a pot, then removed with a slotted spoon and set aside. 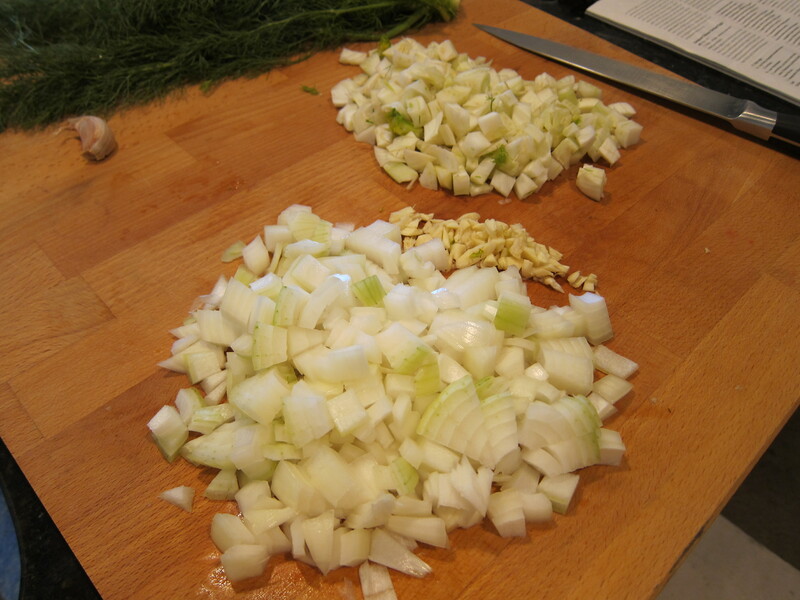 Next some chopped fennel, onions, and garlic is sweated in the lamb fat left over from browning the lamb. 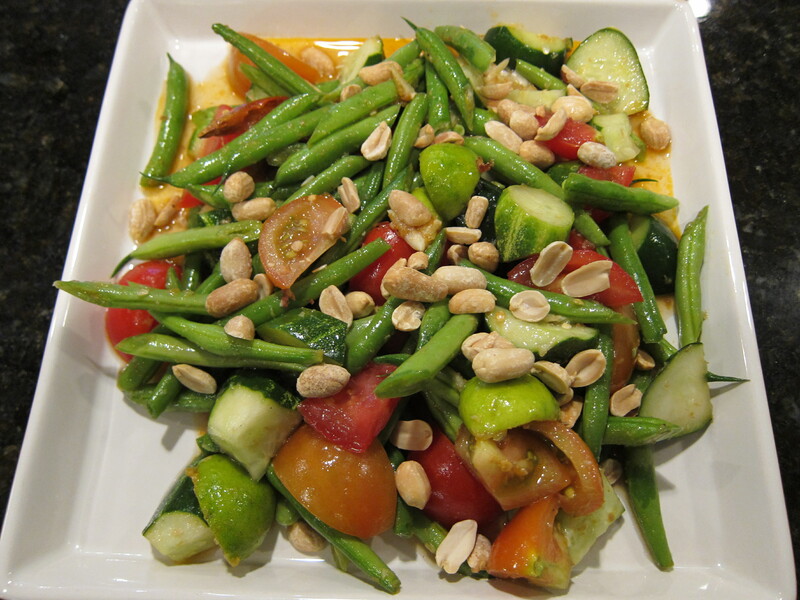 I’m pretty obsessive about chopping my vegetables the same size, since it helps them cook evenly. Also it’s a good way to practice knife skills. 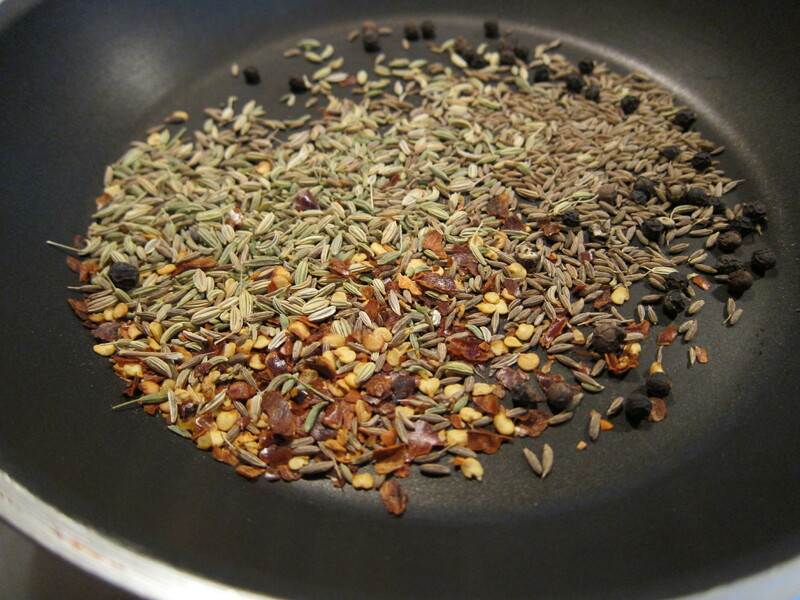 While the vegetables are sweating, I made the spice seasoning for the lamb out of fennel, cumin, black pepper, and chili flakes. The recipe said to toast them and then wrap them in cheesecloth, and once the sauce is done, you take the entire spice bundle out. I went a different route, and grounded the spices up after toasting them. I added the spice mix to the sauce directly, and I didn’t think it was over seasoned. 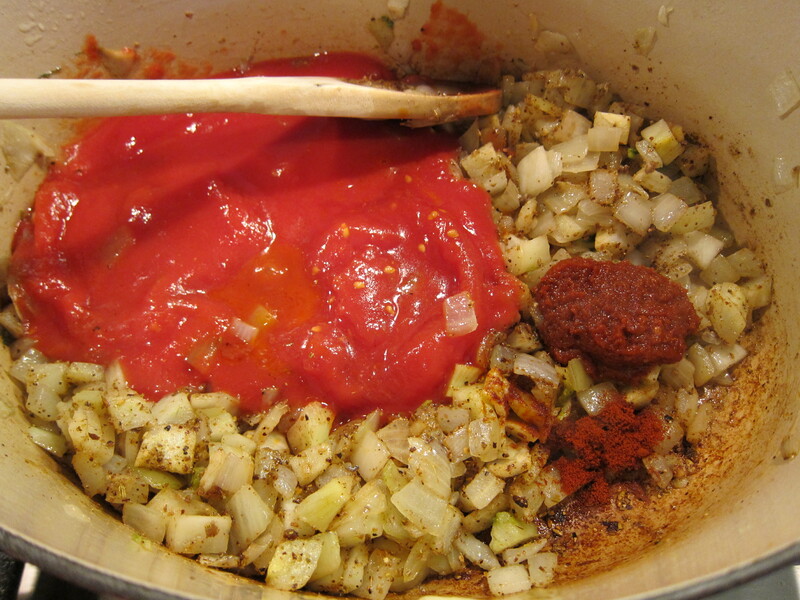 Once the vegetables are properly browned, the spice mix, smoked sweet paprika, and crushed tomatoes are added to the pot. 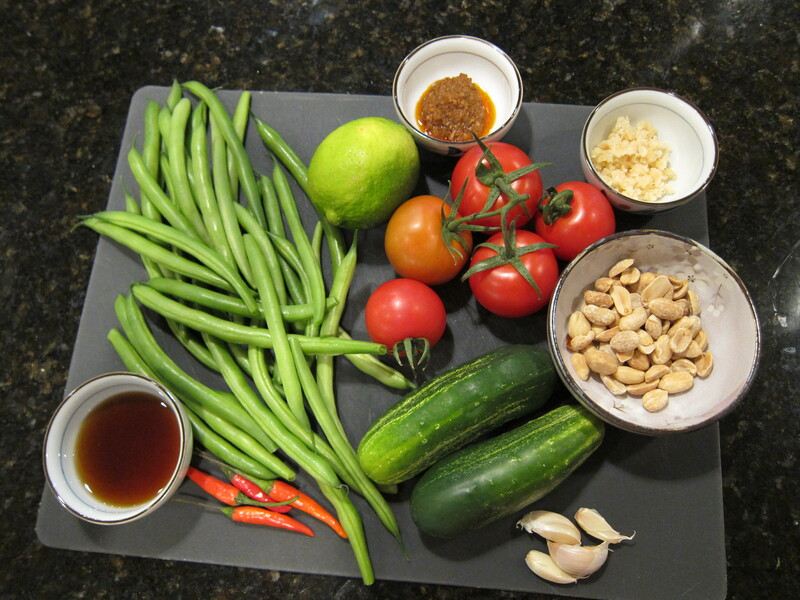 Harissa, a north African hot chili paste is also added to the vegetable mixture; you can find it at Central Market or African specialty stores. 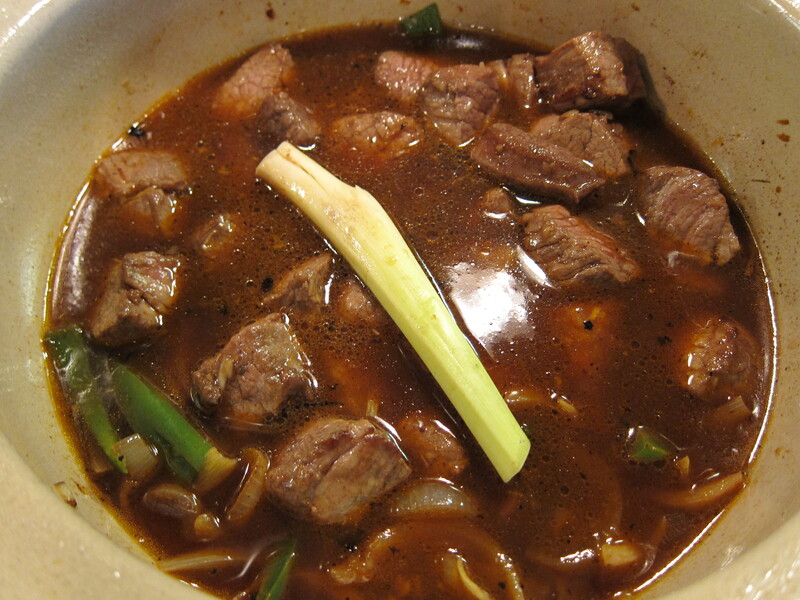 After letting the tomatoes, spices, and vegetables are stirred in the pot for a minute or two, broth and lamb are added back into the pot and simmered for about 1 hour covered, and 1 hour uncovered. Season to taste with salt and pepper. 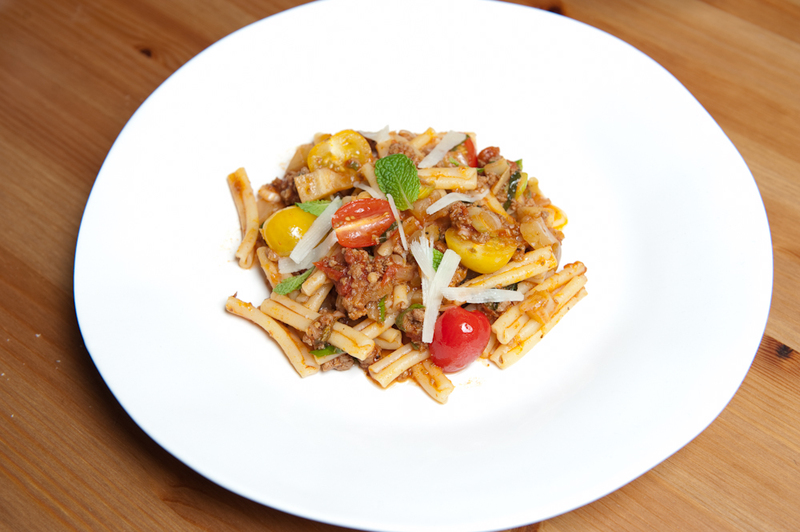 The final pasta dish consists of fresh cherry tomatoes, fresh mint, chopped scallions, and grated Pecorino, a sheep milk based cheese. 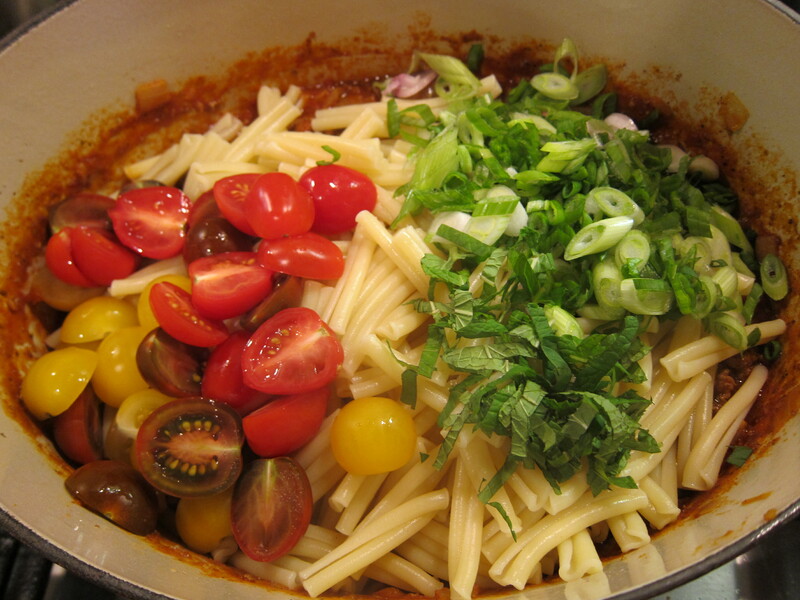 When you are ready to serve, the pasta should be cooked until al dente, per it’s package instructions, and the fresh vegetable mix are stirred into the sauce along with the al dente pasta. Finally, I shaved Percorino cheese all over. 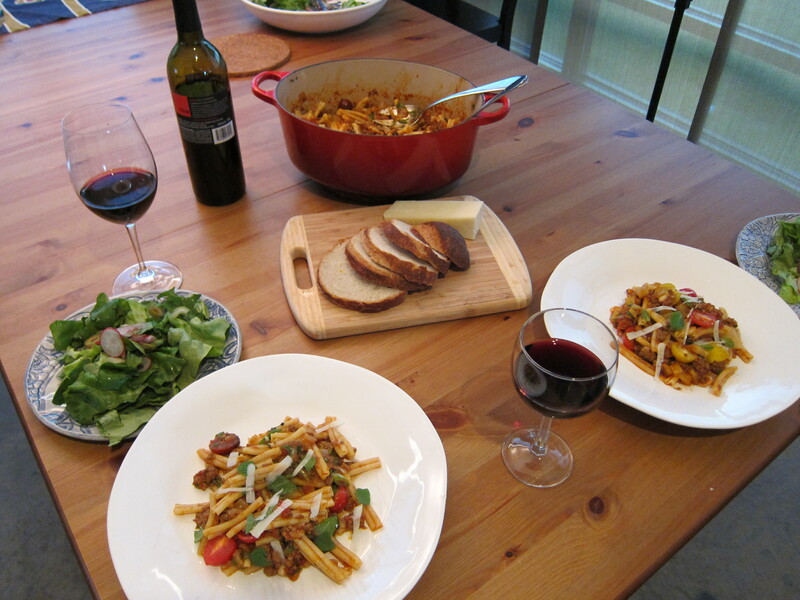 I served the pasta with a simple bibb salad, Italian bread, and the left over Pecorino cheese, and of course, red wine. 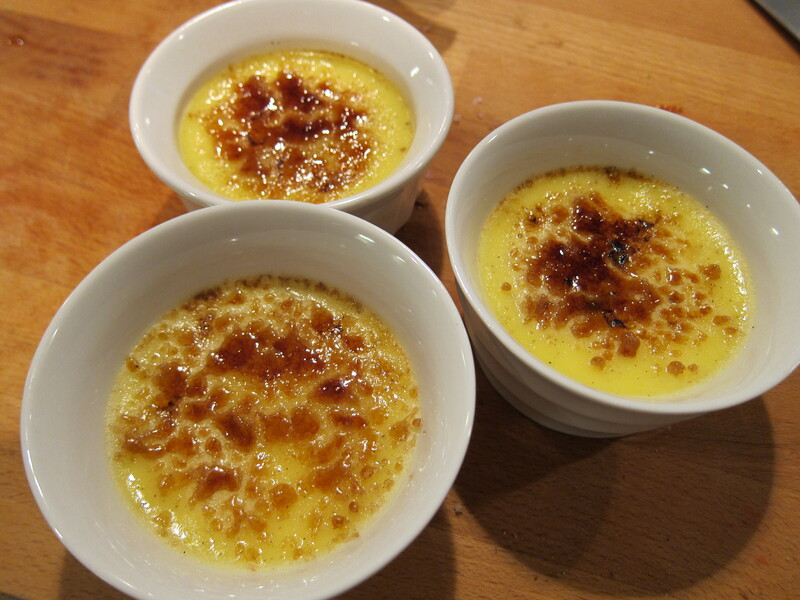 Crème Brûlée is my boyfriend’s self-proclaimed favourite dessert of all time. 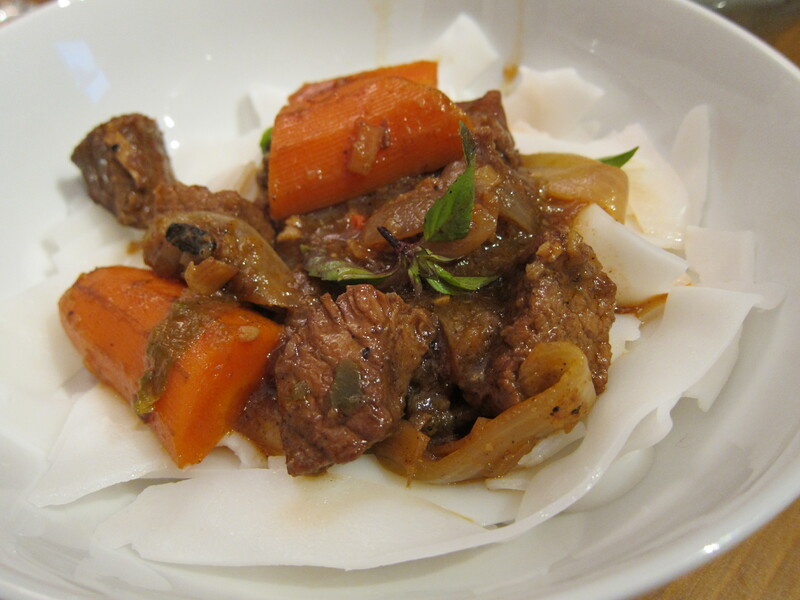 I have never made it before, and on a whim, while my lamb ragu was simmering, I looked up a recipe on-line. The ingredients are pretty basic: eggs, heavy whipping cream, sugar, and vanilla bean, which I bought while in Mexico on Christmas vacation. The heavy whipping cream is heated with the vanilla bean until simmering, and slowly poured into egg yolks that has been whisked with sugar. 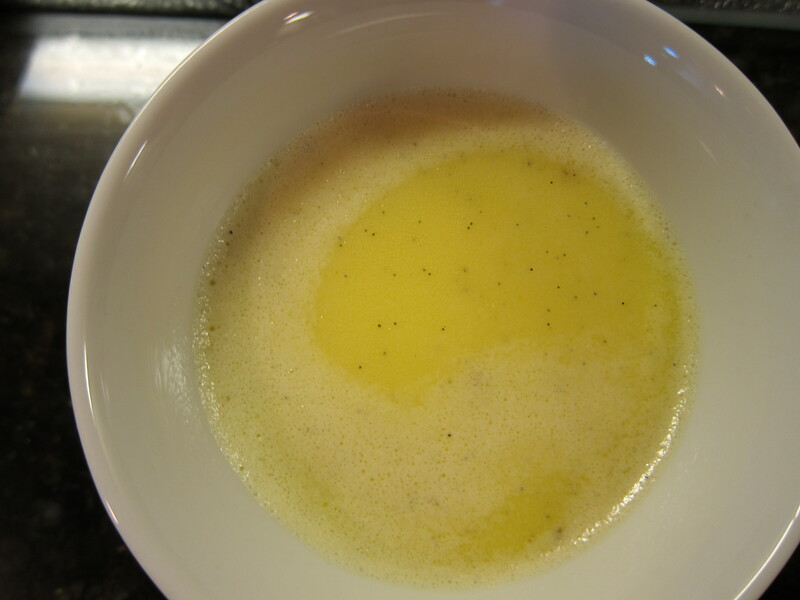 The mixture is then strained to get rid of little extra bits of eggs. I also scraped the seeds from the vanilla bean and whisked it into the egg cream mixture. 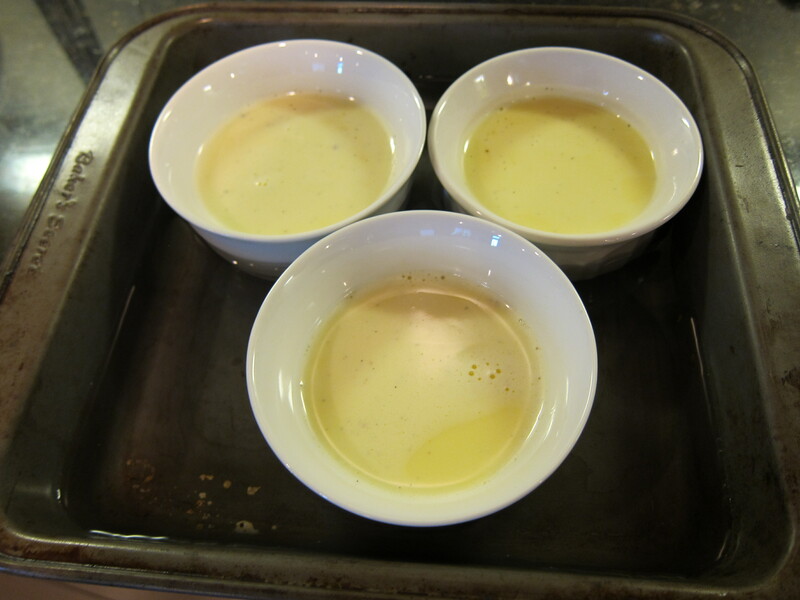 The mixture is poured into ramekins and the ramekins are placed in an oven proof pan with at least 2 inch sides. Then hot tap water is added to the pan until the water line reaches half way up the sides of the ramekins. This will ensure that the Crème Brûlée cooks evenly. 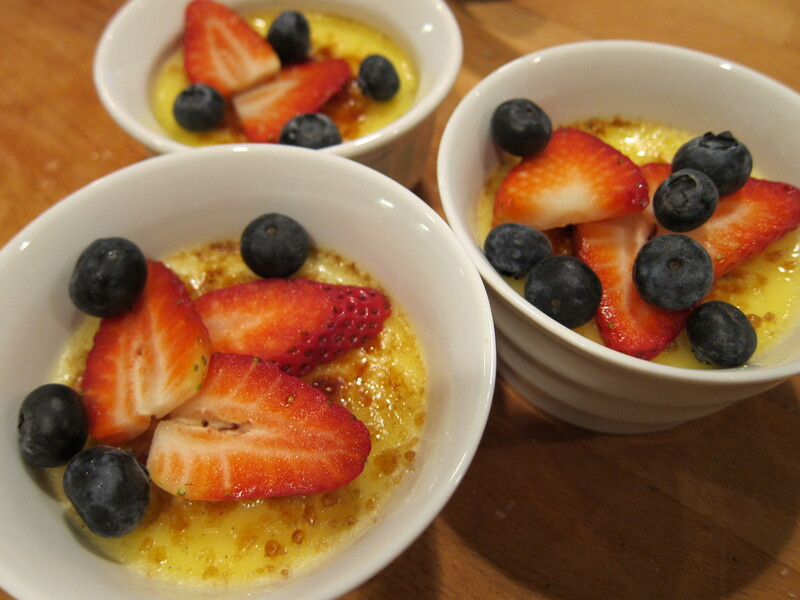 The oven pan is placed in a 300 F oven for approximately 1 hour, or until the sides of the Crème Brûlée are set but the middle is still jiggly. Do not over cook, or else the Crème Brûlée will be cake-y. 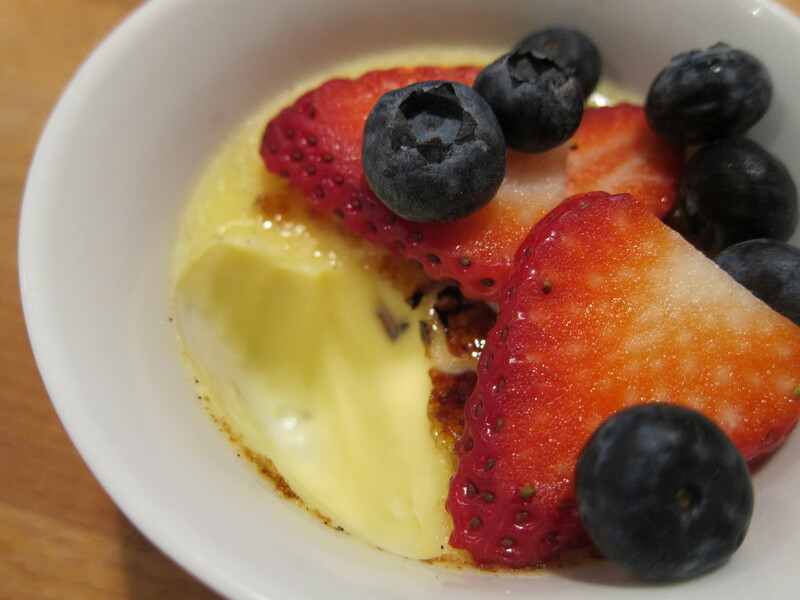 You can see little bits of vanilla bean seeds floating in the Crème Brûlée. The Crème Brûlée is chilled in the fridge for at least 3 hours, which I did, but I think it honestly needs at least 8 hours or overnight for it to completely chill. When I was ready to serve, I sprinkled some brown sugar on top of the custard, and blasted it with my mini torch. A mini torch is actually a very useful tool in the kitchen, you can use it for meringues, and even to brown meat to give it a crusty exterior. The recipe asked for raw sugar, which I did not have any, so I used regular brown sugar and it worked fine. 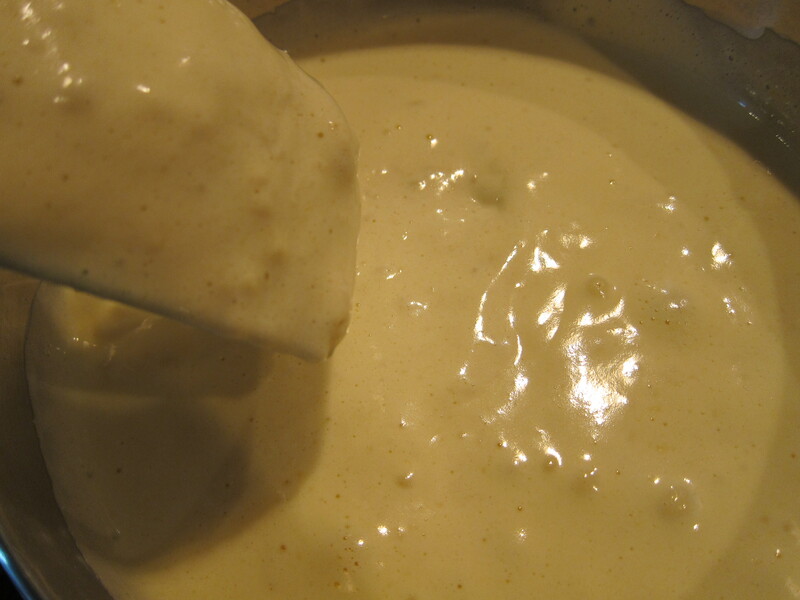 After browning the sugar, I put the custard in the freezer for a few minutes to cool down the sugar. To finish off the Crème Brûlée, I put some sliced fresh berries on top to cut down on its richness, and also add to the visual presentation. While at the grocery store getting ingredients for my Caribbean food dinner, I found these Okinawa sweet potatoes for sale at my local central market. Okinawa sweet potatoes, also known as purple sweet potatoes, are supposedly an Asian variety of sweet potato (Supposedly because I’ve also heard they are not Asian at all). 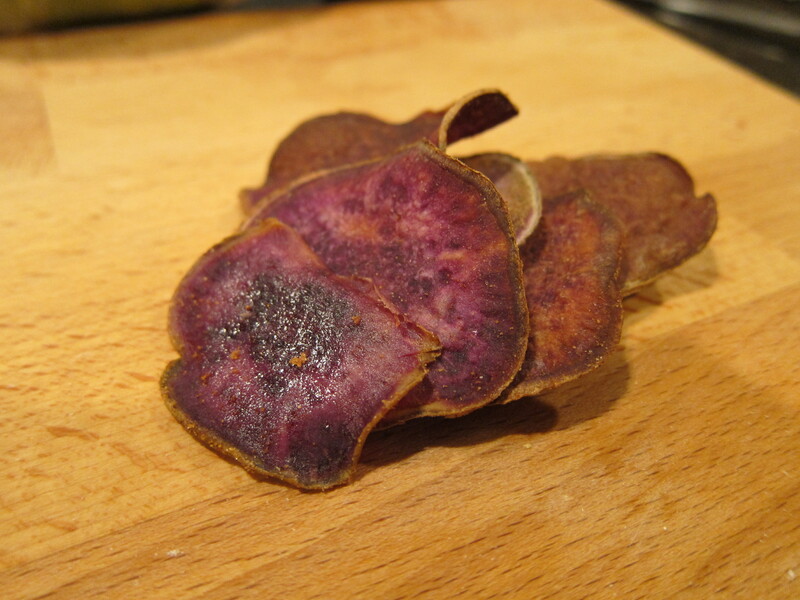 They are different from Ube, which is a Philippino, or southeast Asian yam of very brightly colored purple. I’ve had Ube and Ube icecream while in the Philippines and they are fairly hard to find in Texas. Yams and sweet potatoes aren’t the same thing! Anyway, I saw these cute little sweet potatoes and wanted to make this boiled cassava like dish I had in Dominica, but decided against it because I was already making rice and beans. I looked online for recipes with Okinawa sweet potatoes, and there weren’t many, however, an ingenious blogger said that they made oven fried sweet potato chips with Okinawas using a Emril Lagasse recipe from Foodnetwork.com. When I first started cooking back in college I used foodnetwork.com almost exclusively, becuase I didn’t know any better, and honestly it was a good start for beginner cooks. 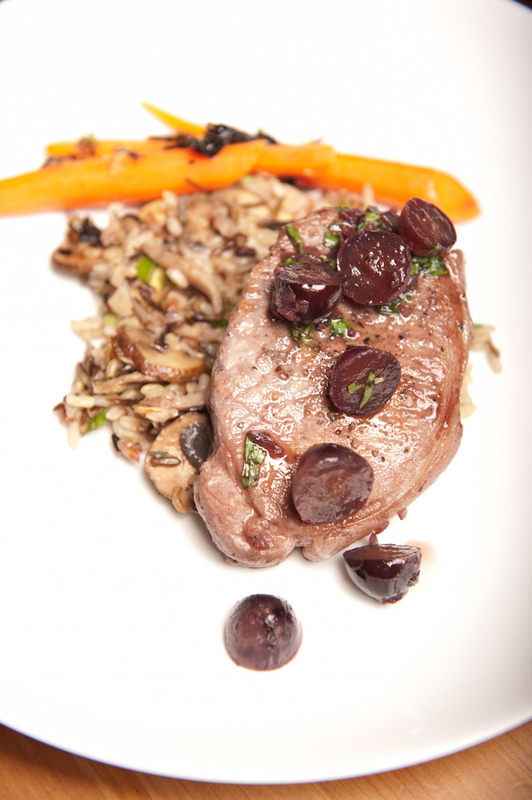 There are great recipes from foodnetwork.com, but there are also many bad ones, and the hit or miss inconsistency of their recipes made me look else where. I have to say that I do really vouch for this recipe, if you have the right tools. 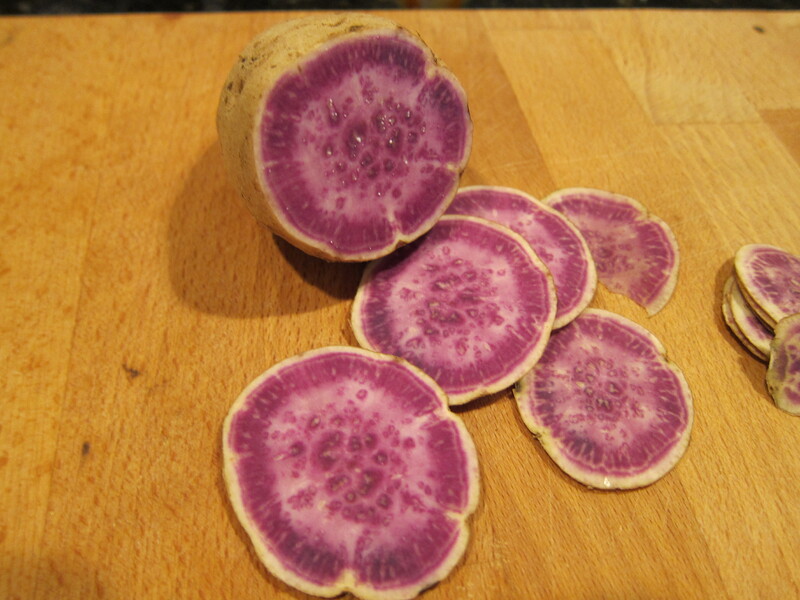 The Okinawa sweet potatoes are actually fairly light skinned on the outside, and vibrantly purple with some splashes of cream in the center. I sliced these by hand using a “Shun” knife my boyfriend bought for me two Christmas’ ago. 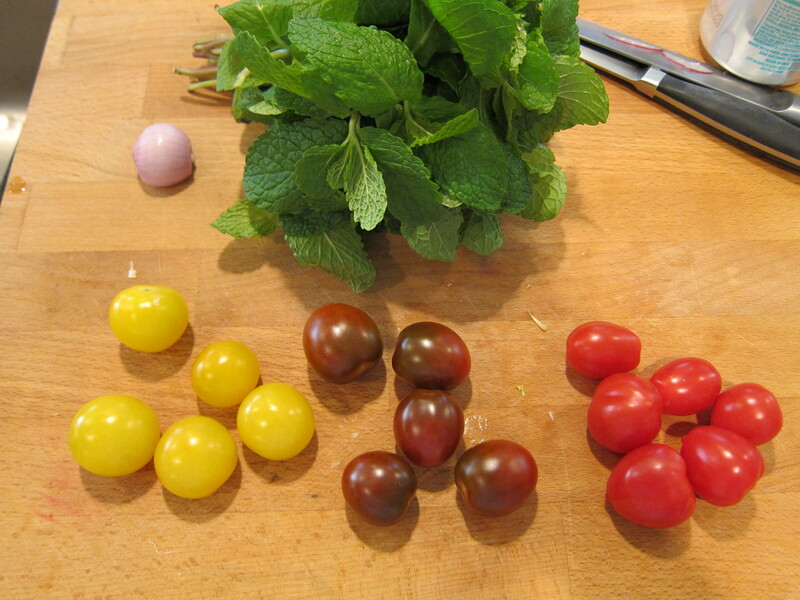 I would suggest buying and using a mandolin if you don’t have the proper knife skills to slice these thinly. If the slices are too thick, the baking time will increase, and if you slice some slices thick and some slices thin, you will have to constantly check to make sure that the thin slices don’t burn, and the thick slices keep cooking. The slices are brushed with olive oil and baked in a 400F oven for 10 minutes or thereabouts, depending on the thickness of your slices. 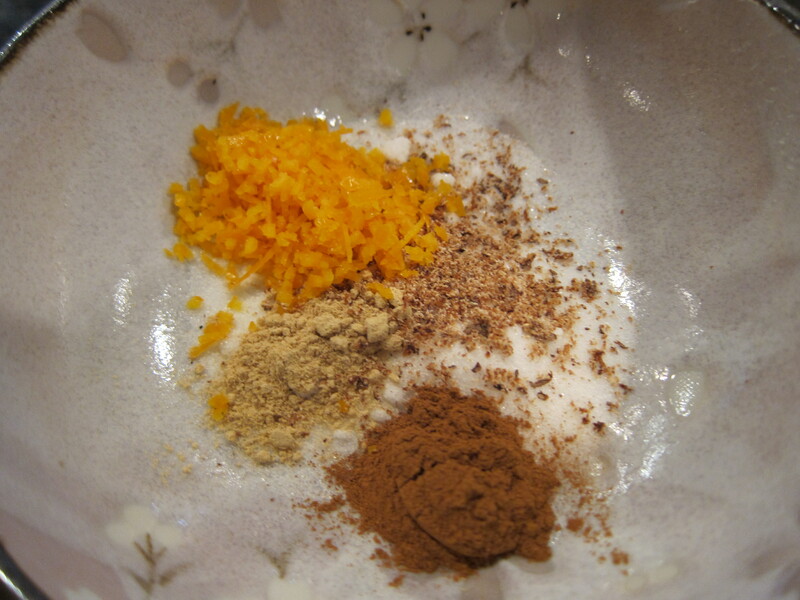 Meanwhile, I worked on the spice mixture you toss the baked chips in, which consists of a little bit of sugar, cinnamon, orange zest, nutmeg, and ground ginger. 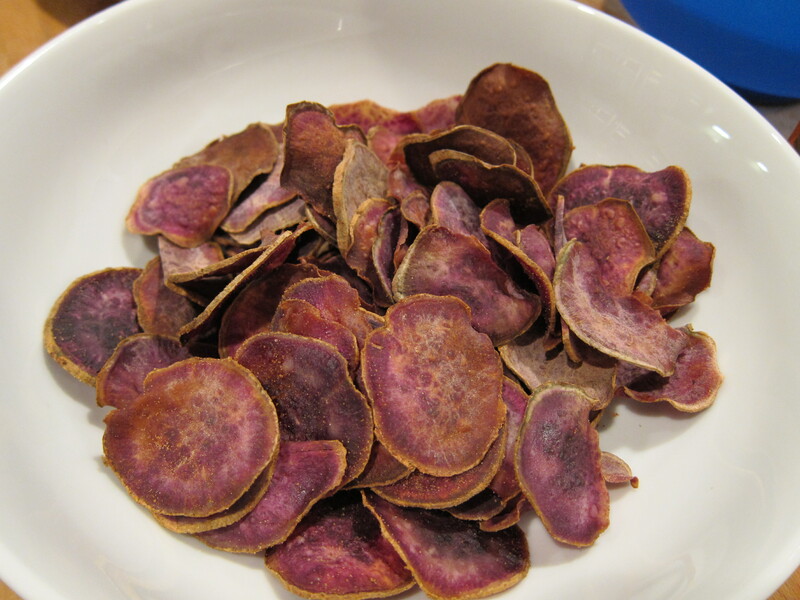 These chips are very flavourful, and especially pretty in their purple color. 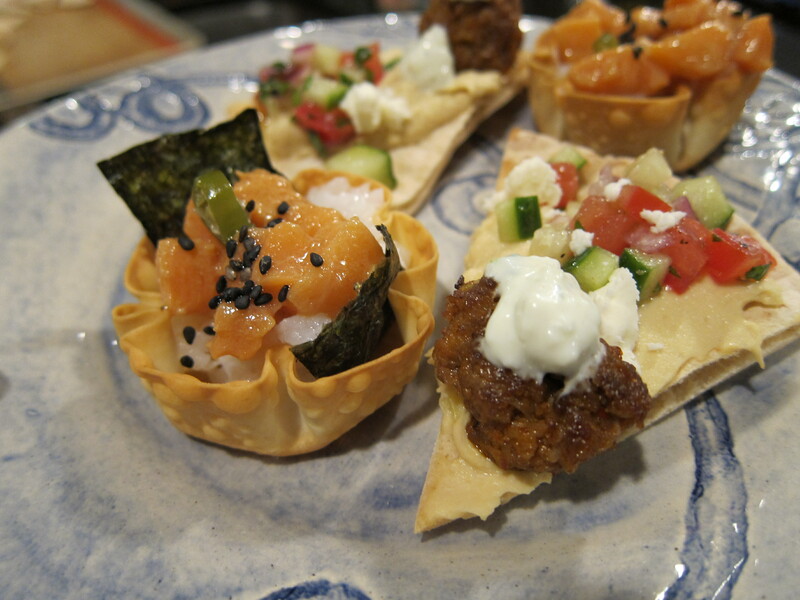 I’ve since made them twice, and it’s a great little appetizer or a light side item. 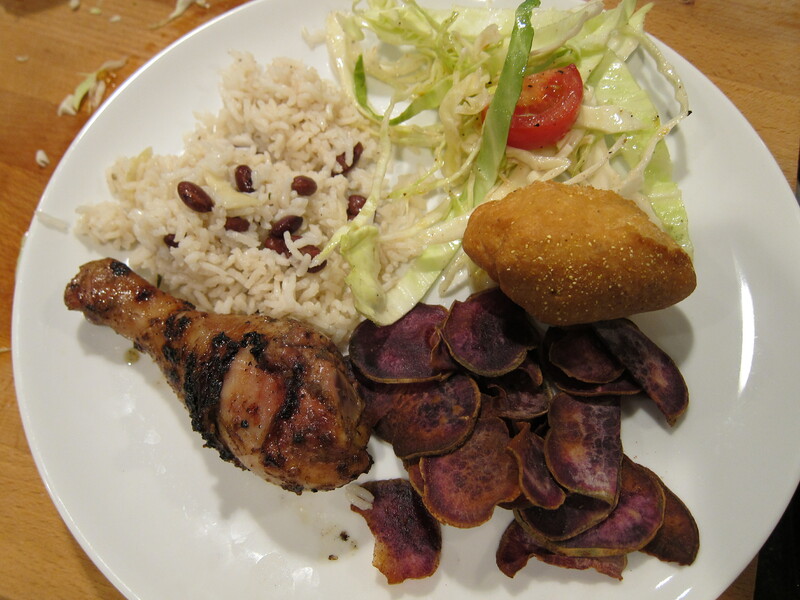 I served them with my Jamaican Jerk chicken and red beans and rice. After a long week at SXSW, I didn’t want to go out for dinner. My boyfriend wanted something comforting and simple, which always translates to Tex-Mex food. When we traveled to Baja California Sur over Christmas holidays, we had these amazing steak tacos that were made from the Arrachera, or the skirt cut of beef. 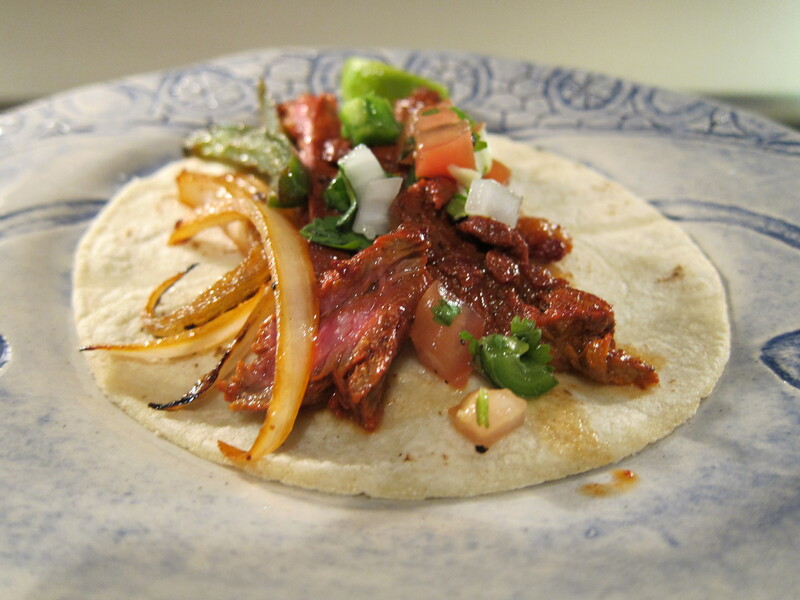 I had been wanting to make these steak tacos for a long time, but I’ve not had much luck in finding a good recipe. The arrachera steak I had was so tender, so juicy, that I thought there had to be some sort of special marinade that breaks down this tough cut of meat. 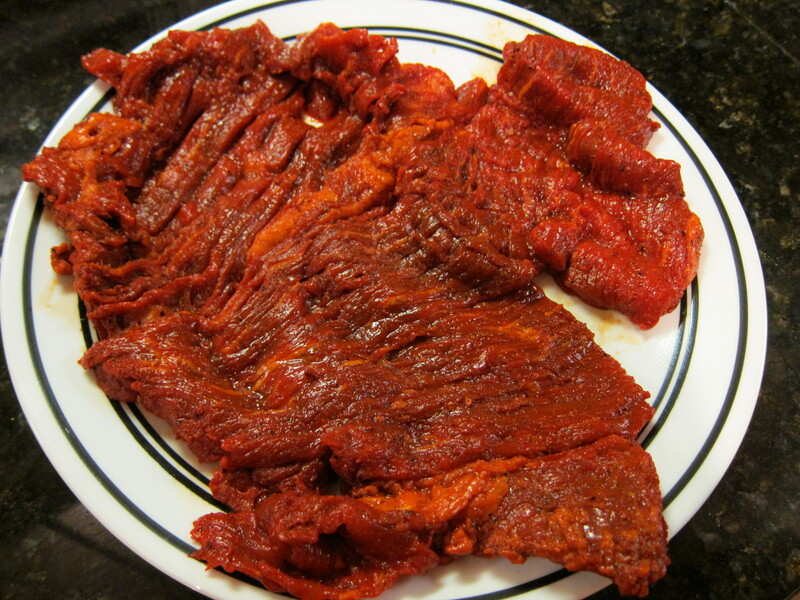 I did a little bit of research online first to figure out what arrachera even means and why is it different than, say, flank steak. 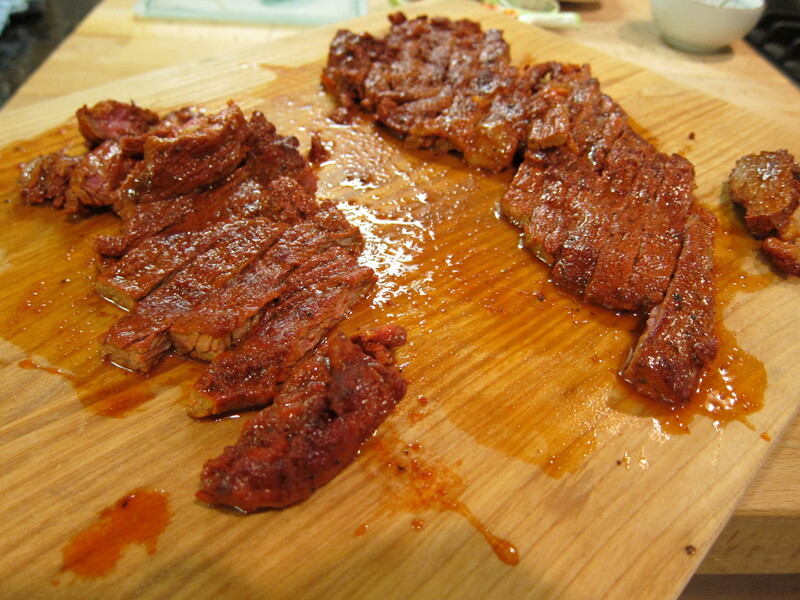 What I found out is that flank steak has grains that runs horizontally, and arrachera, or skirt steak has grains that runs vertically. I also learned that these steaks are often horizontally halved to reduce the overall thickness of the meat so all it requires is a quick 1 or 2 minute sear per side to get to the medium rareness that makes it so tender and juicy. 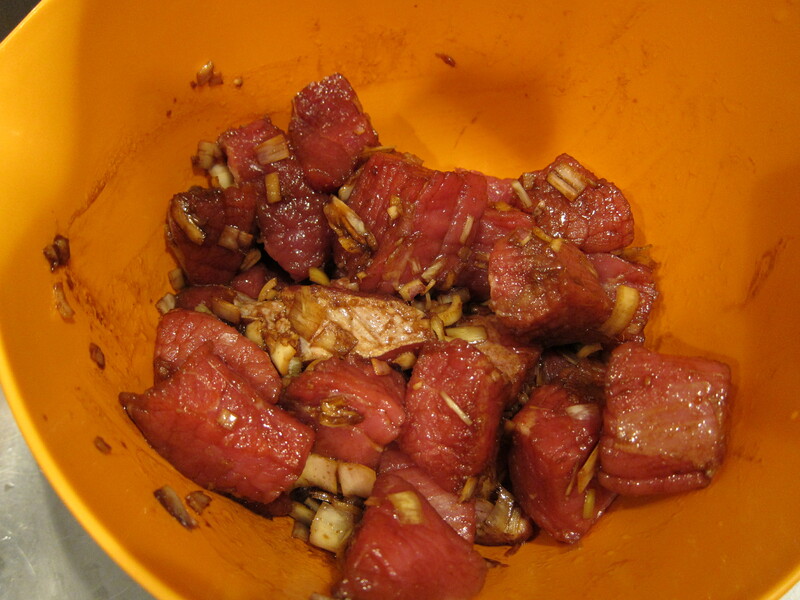 I found many recipes that recommended marinating overnight, or even days in advance to tenderize the steak, which would not work for me if I wanted make the tacos the day of. 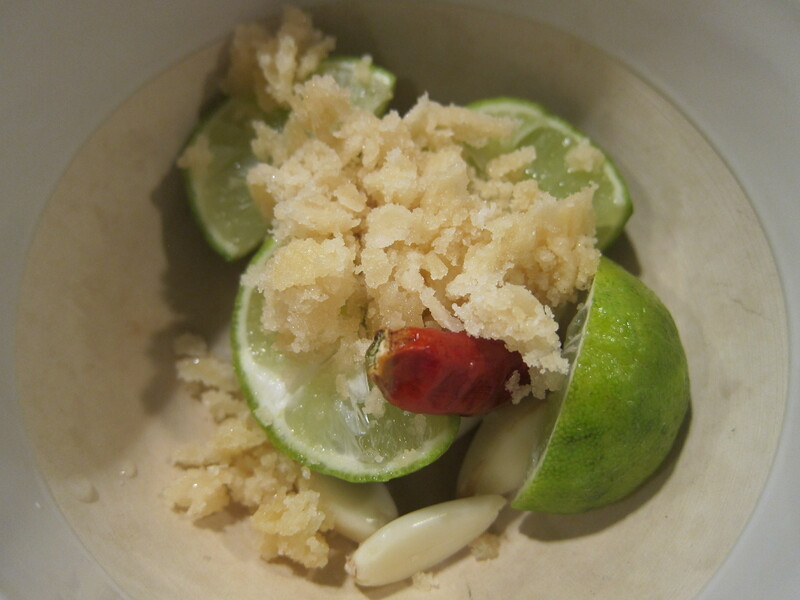 I also found a Rick Bayless recipe that called for a quick lime juice, salt, and pepper dressing right before cooking. With so many different opinions on how the steak is best cooked, I decided just to go to the local Mexican store, gather my ingredients, then come home and figure out what to do. At the Mexican grocer, I found a pre-seasoned and marinaded Arrachera steak, which the butchers also conveniently cleaned of all fat and silvery tissues before hand. The meat had an orange reddish hue, which I imagine came from the Achiote Paste they used as a part of the marinade, and right away, I knew that’s what I was going to buy and cook with. The steak it self only takes a few minutes to cook. I heated up some oil in a cast iron skillet, turned up the heat, and once the pan was ready, I seared the steak for about 1.5 minutes on the first side, and 2 minutes on the second side. 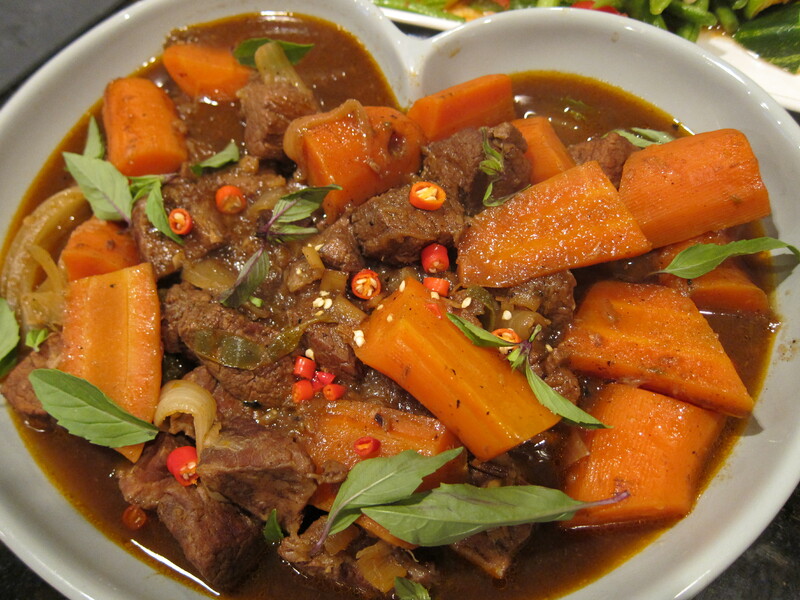 You don’t want to over cook this meat, otherwise it will be way too tough to eat. Even though it is a cheaper cut of meat, you want to treat it with the same respect you would treat a $20 piece of steak. Let it rest for a few minutes for the liquids in the steak to redistribute. 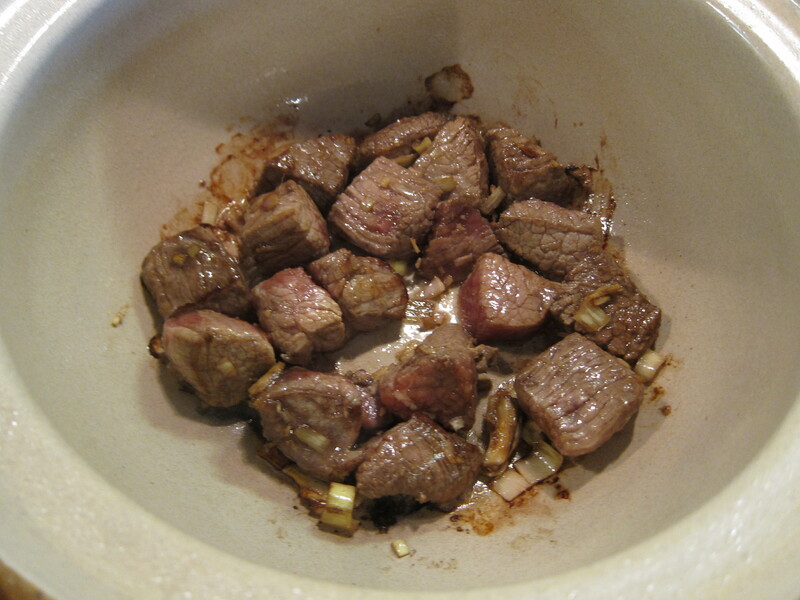 Even if you had cooked it for the right amount of time, if you cut it into it too soon, the liquid will drain out, and you will be left with a dry steak. 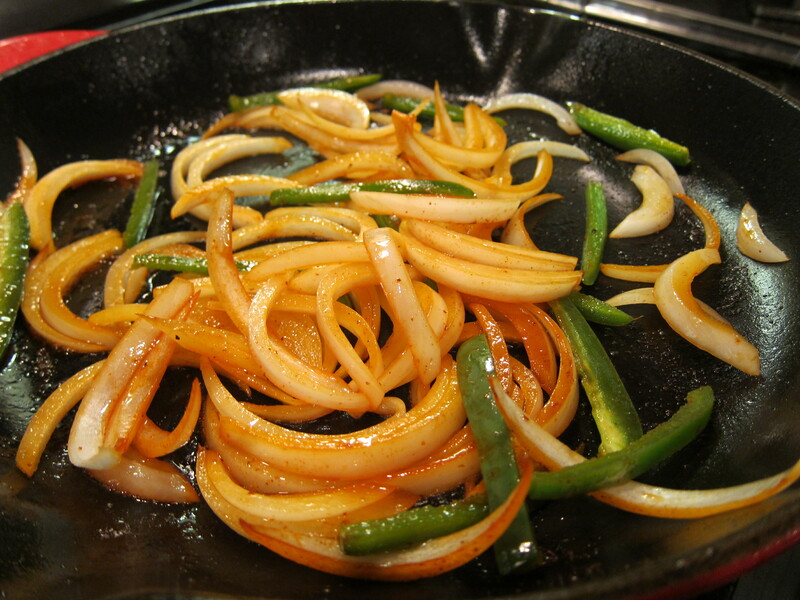 After I removed the steak from the hot pan, I tossed in some sliced onions and de-seeded jalapeno peppers, since my boyfriend loves grilled veggies. To go with the tacos, I made some pico de gallo, and fresh guacamole. 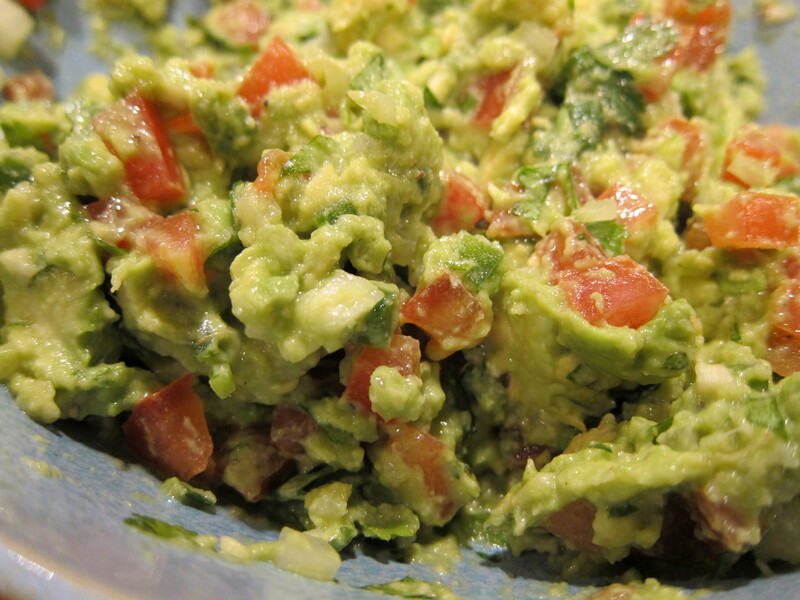 For the guacamole, I used a Rick Bayless recipe composed of very fresh ingredients. 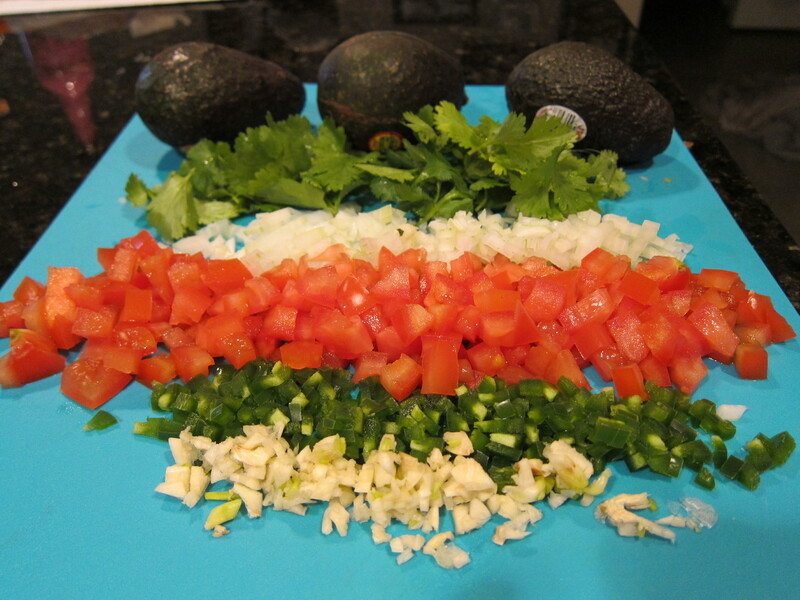 I love how colorful the vegetables are, and I noticed how the colors reflect the colors in the Mexican flag. 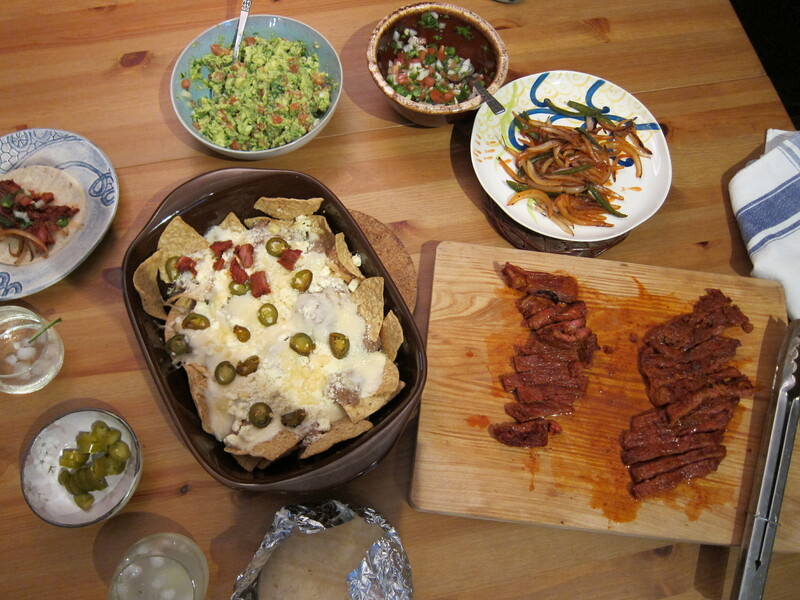 I made fresh Margaritas and some refried beans nachos to complete the meal. This is my attempt in making “trendy” food. Coming up with new recipes is not my strength. I like having the safe guard of a set of instructions to follow when I’m doing something that I’m not familiar with. However, once I’m fully comfortable with something, I do like to experiment. My boyfriend suggested that I make Nachos for dinner, but putting my spin to it. I thought about the composition of a Nacho: some protein, some veggies, some sort of mashed legumes, tied together with a crunchy shell. For whatever reason, the thought of doing different ethnic style nachos came into my head. I thought how pitas are very much like tortillas, and how hummus is a lot like refried beans. I wanted to do a Gyro Nacho with ground lamb. A few weeks ago, I made these lamb meatballs for a pizza, so I repeated the recipe. 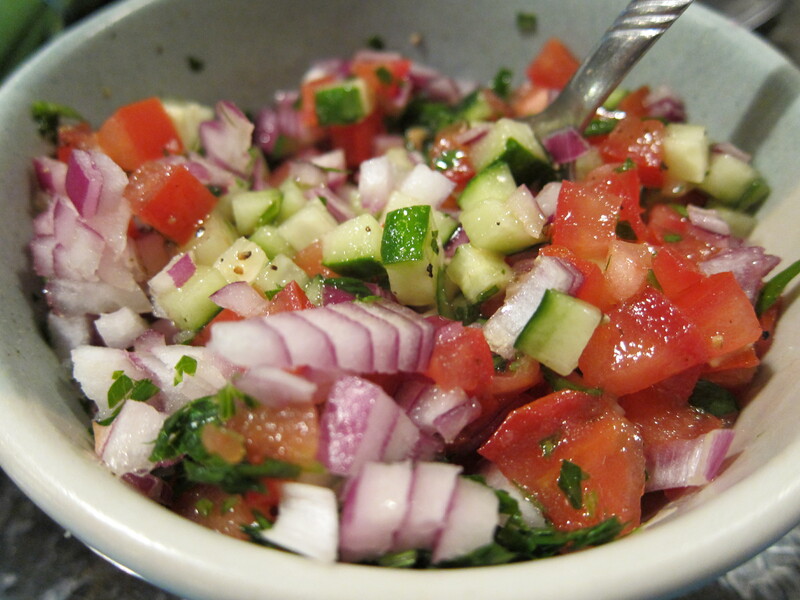 I also made a relish of onions, cucumber, tomatoes and Italian parsley. 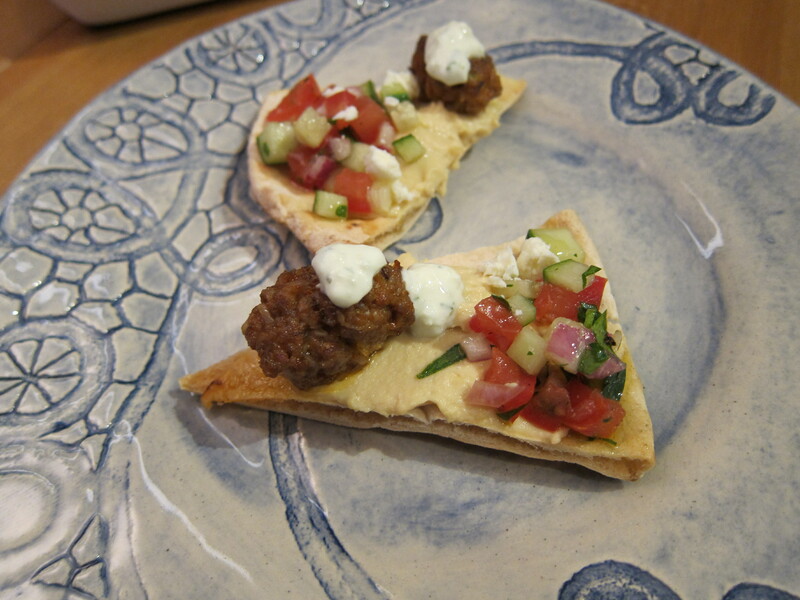 I baked some pita bread until they became crispy, spread some store-bought hummus on the pita, topped it off with some relish and lamb meatball. I also put a little dollop of store-bought Tzatziki sauce on top of the lamb meatball. It makes for a great little appetizer. 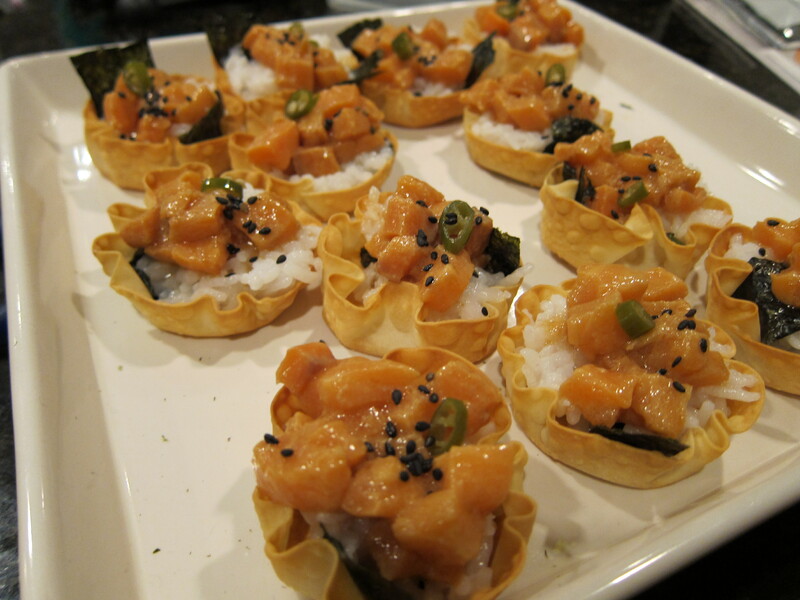 I also thought that it might be fun to try to do an Asian themed Nachos, so I bought some sushi grade salmon, and decided to make Salmon Sushi “Nachos”. 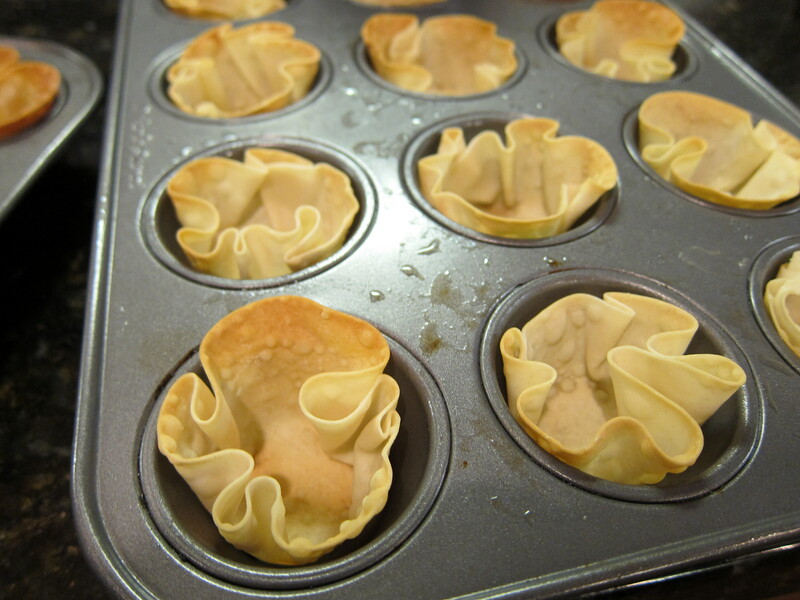 For the little carrier, I baked up some store-bought wonton skins in muffin pans. 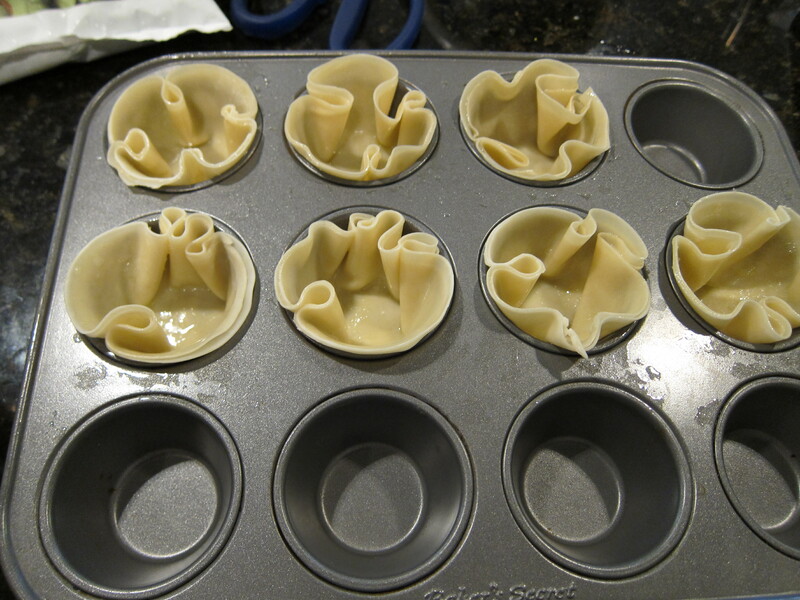 I also sprayed both sides of the wonton skin with oil spray before tucking them in the muffin pans. It doesn’t take long for the shells to brown, so watch these carefully. 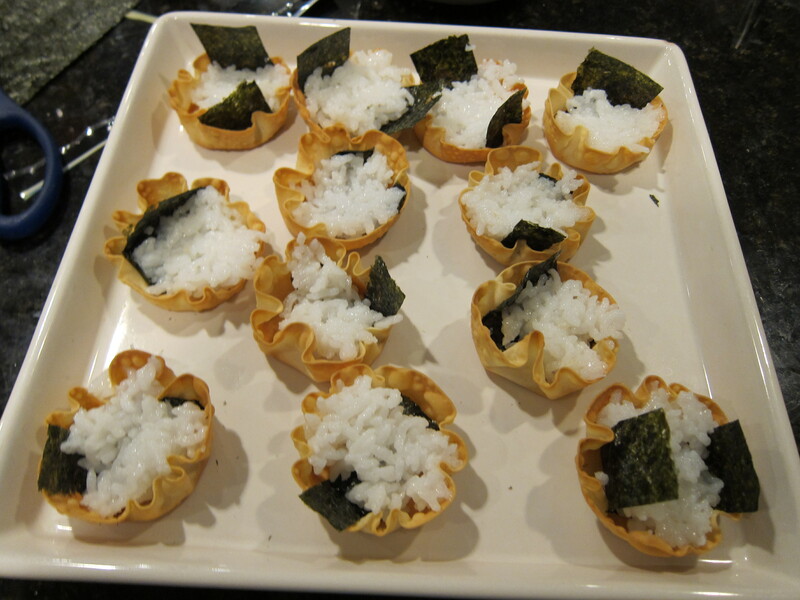 I first layered some cut up Nori in these little cups, then spread some prepared sushi rice on top of the Nori. Then I cut up the salmon into 1/4 inch dice, and spooned them on top of the rice. I finished these off by sprinkling a little bit of toasted sesame seeds and pickled Thai Chilies to give it some heat. I would definitely serve these at my next dinner party as appetizers. 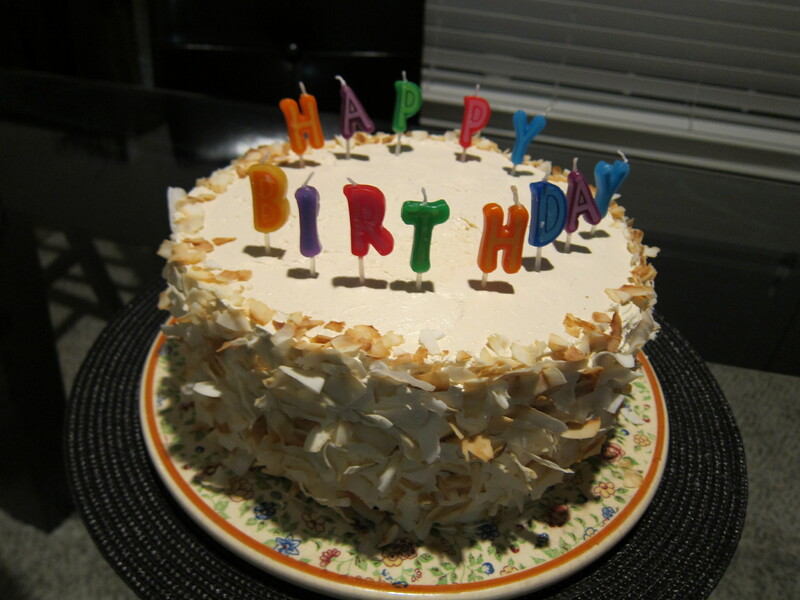 It was my boyfriend’s sister’s birthday, and she wanted a coconut cake. I originally wanted to make a 6 layer coconut cake with passion fruit curd filling, but the Austin Central Market is not very well stocked, and did not have the passion fruit puree like it’s Dallas store does. I settled for a Tyler Florence recipe from Food and Wine. 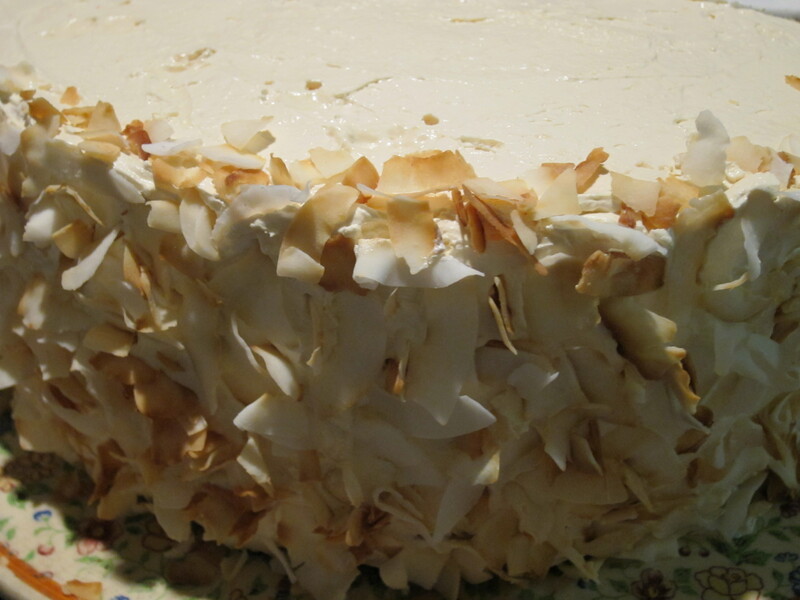 Instead of a separate cake filling the layers are brushed with a mixture of rum and simple syrup, and frosted with a coconut buttercream. The recipe called for 4 cake pans, but I only had 3. I also thought about using 2 pans and halving each cake, but there was two much batter for 2 pans, so I just settle for dividing between 3 pans. The layers were a bit thick for my liking, and next time I will probably half each cake to two so I will have a 6 layer cake. 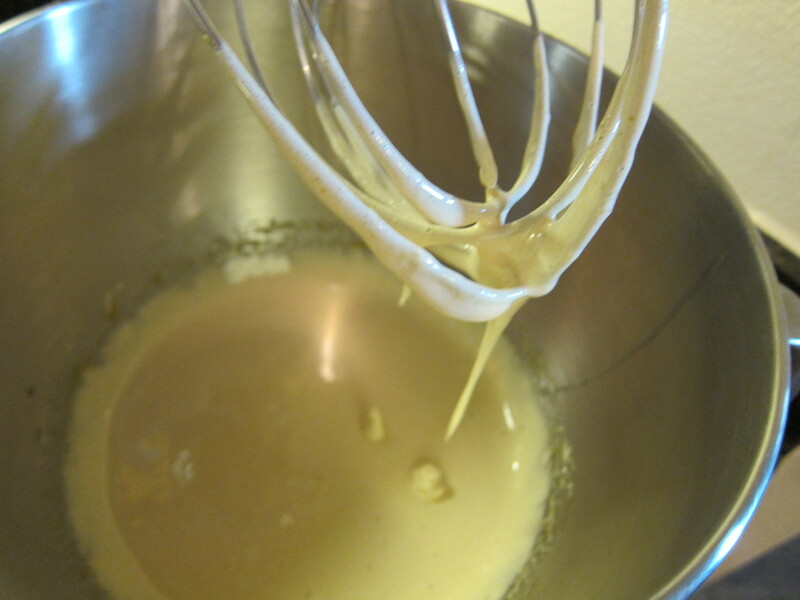 To make the batter, a lot of eggs, sugar, and vanilla extract are beaten together in a stand mixer. 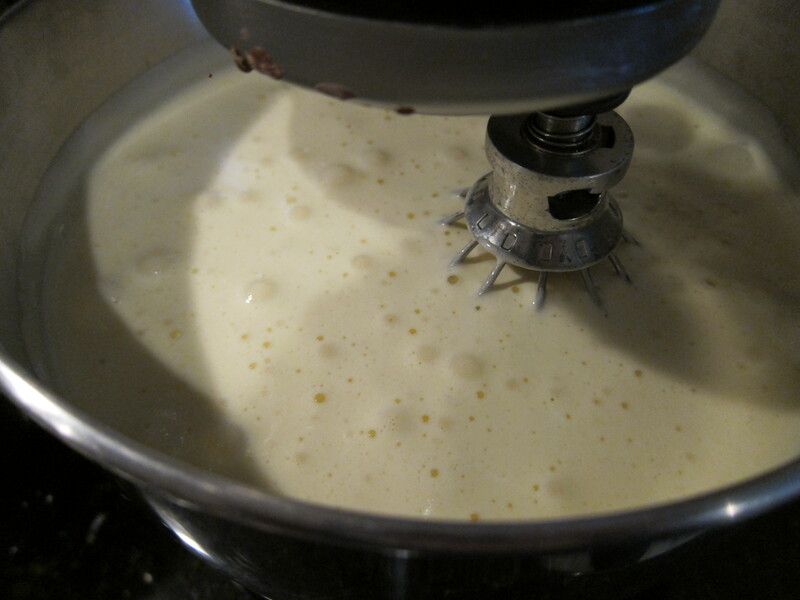 The batter will become pale and triple in volume. The dry ingredients then are folded gently into the egg batter. It’s important to fold from the bottom so the dry bits are thoroughly mixed, otherwise you might get little balls of flour or corn starch in the baked cake. 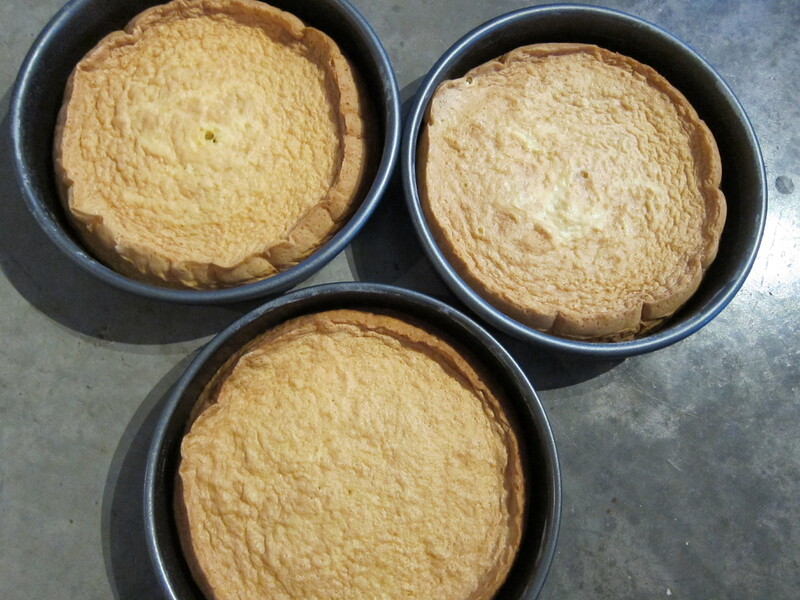 The cakes are baked and cooled and set aside until ready for assembly. The cake will fall a little bit as it cools, which is normal. The buttercream frosting is a little complicated to make, and requires constant attention. This basic concept is that egg whites are beaten while hot sugar syrup is mixed in at the same time. The egg whites will be cooked by the hot syrup, and once the sugar is fully incorporated, the meringue is then beaten until cooled to room temperature, and a lot of room temperature butter is beaten into it. 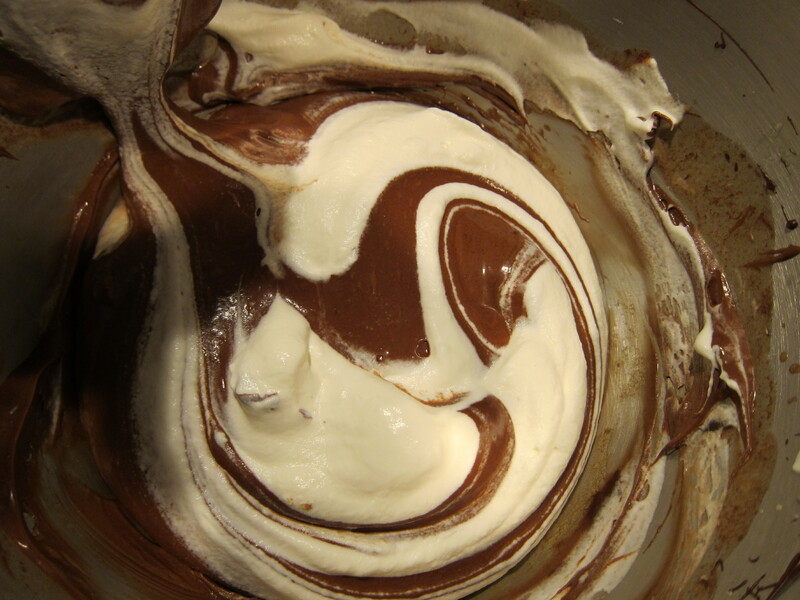 To make the meringue base for the frosting, some sugar is cooked in a pan until it reaches “soft ball stage”. “Soft ball stage” means the cooked sugar has reached a temperature range of 235F to 240F, and if a little bit of sugar at this point is dropped in cool water, it will form into a soft and pliable ball. 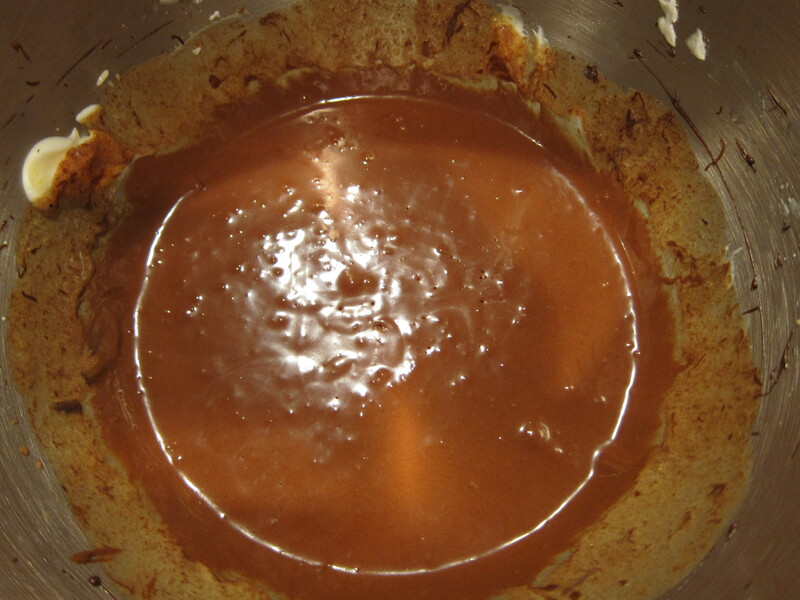 I would highly recommend investing into a candy thermometer to monitor the sugar cooking process, since the “soft ball stage” is very near full caramel-ization, and, if you don’t watch it carefully, may burn. When the sugar is about 5 degrees from reaching the soft ball stage, you want to start beating the egg whites on high speed until soft peaks form. 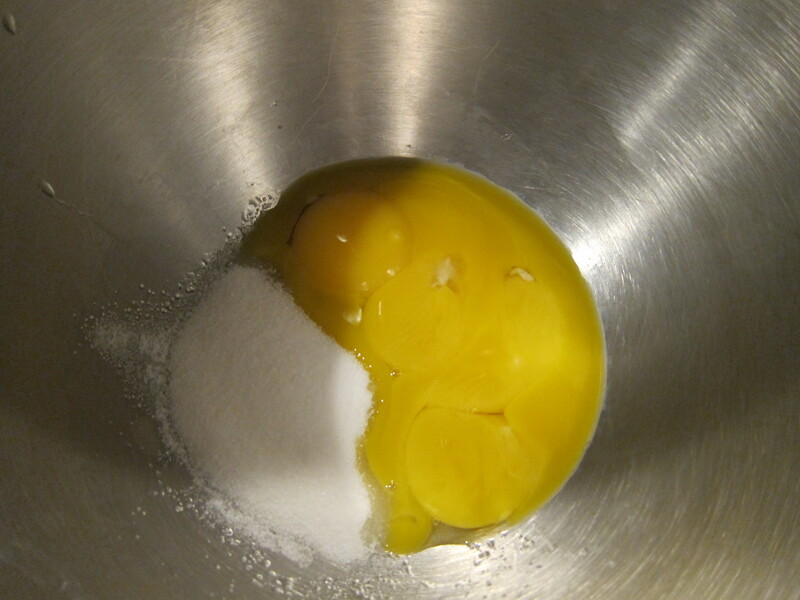 If your egg whites reach this stage before the sugar has reached the soft ball stage, you can just leave the egg whites in the soft peak stage until you are ready to pour in the sugar. Be very careful when pouring the sugar, because it will be very hot, and you want to have a steady hand so the sugar is poured in gradually, not all at once. I also highly recommend making this frosting in a stand mixer if you don’t have a second pair of hands to help. Also make sure your sugar is at the right temperature, if it’s not hot enough, it will harden quickly and make a mess with your stand mixer. I don’t have too many photos of making the meringue, because things happen very quickly, so I didn’t have a spare second to document the process. After the sugar is fully incorporated, the frosting will be fluffy, shiny, and hot. 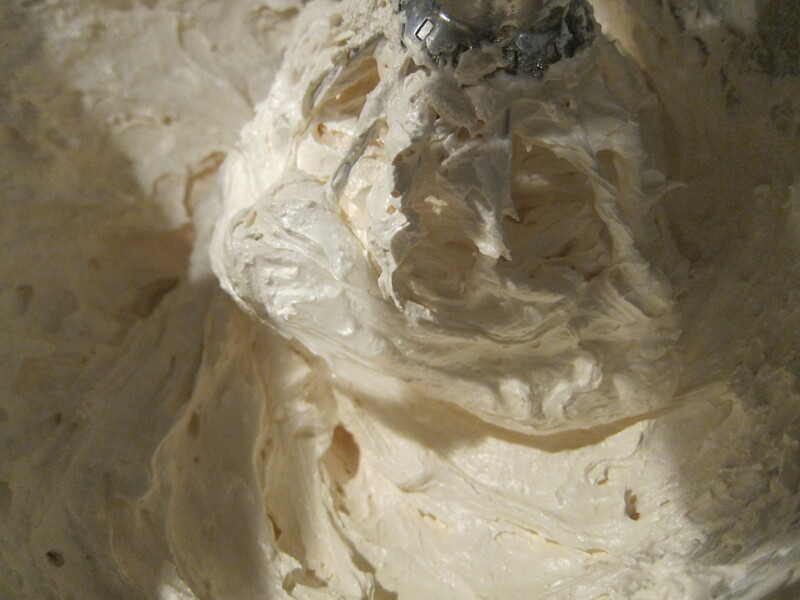 I usually leave the mixer on for 20 minutes so that the meringue is beaten until cooled to room temperature. If it’s too warm, when you add butter, the frosting will curdle. If that happens to your buttercream, just let the frosting cool in the fridge a bit, then continue. The frosting will reshape it self if the temperature is correct. When the meringue is cool enough, room temperature butter is added, a couple of tablespoons at a time, into the meringue. 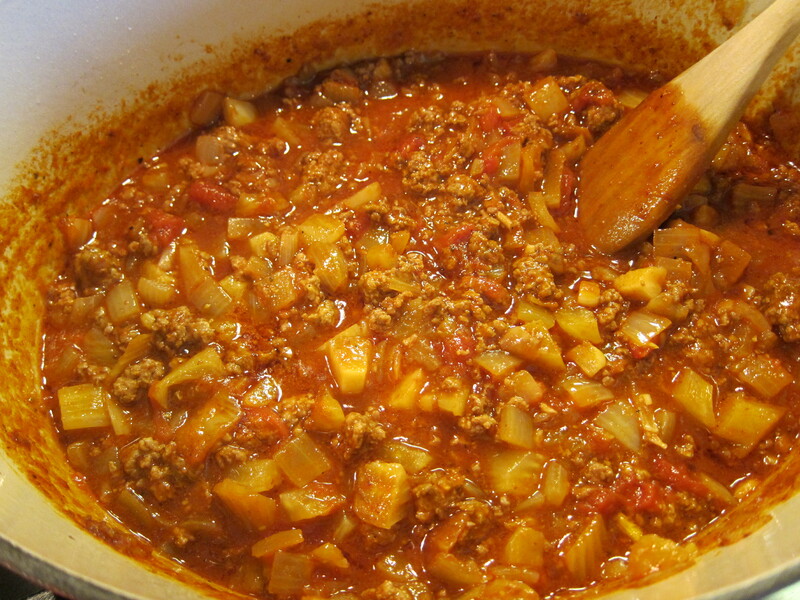 Make sure that the butter is fully incorporated before adding more. Finally, beat in the coconut extract. 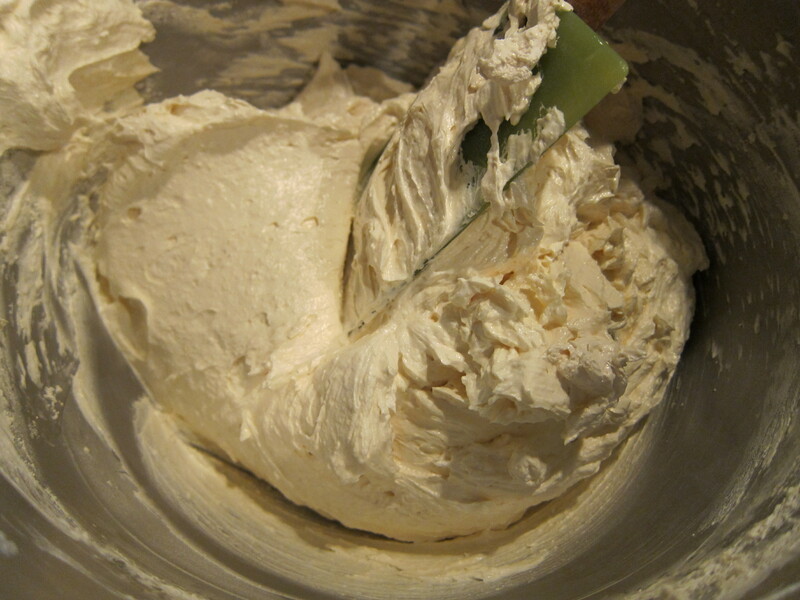 The buttercream can be kept in the fridge, or frozen, until ready to use. If it’s been sitting in the fridge, you want to beat it for a minute or two in the stand mixer before using. 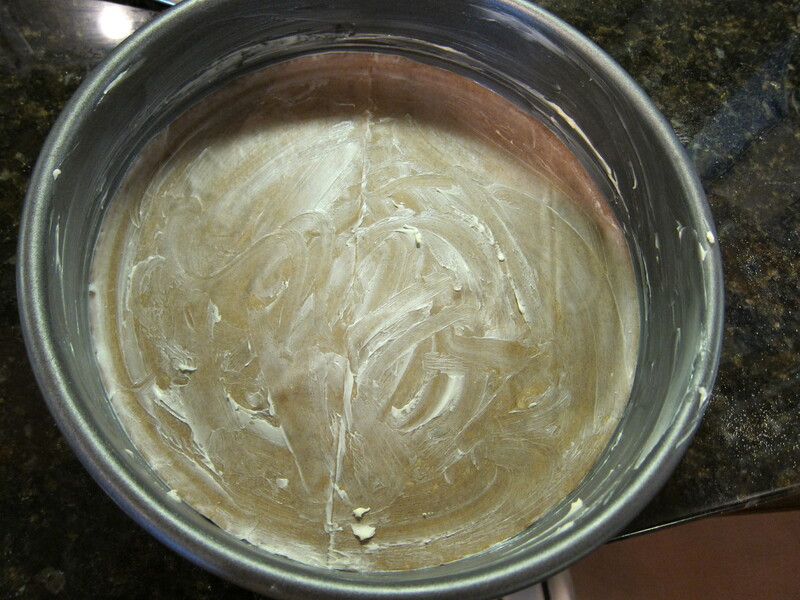 If your butter cream is frozen, thaw it out over night in the fridge, then beat it for a minute or two before using. 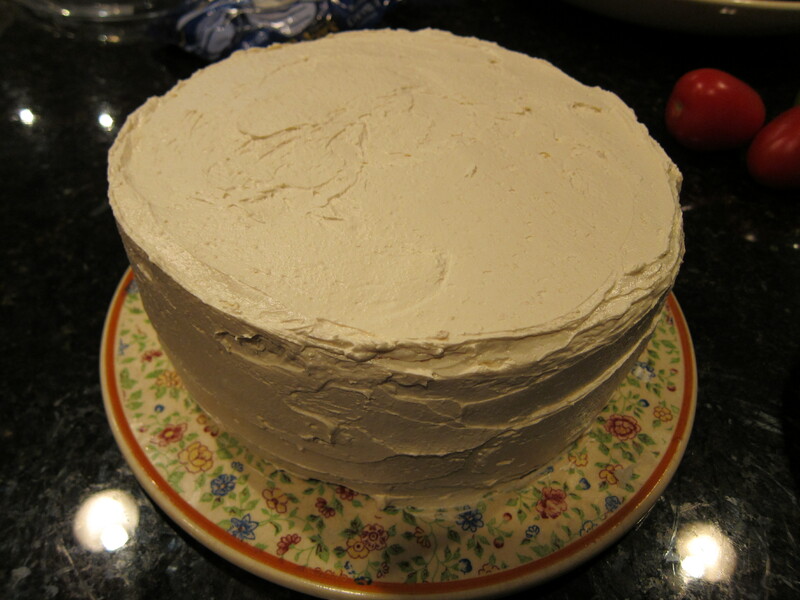 To assemble the cake, a mixture of simple syrup and rum is brushed over the first layer of cake, then buttercream frosting is spread over the cake. 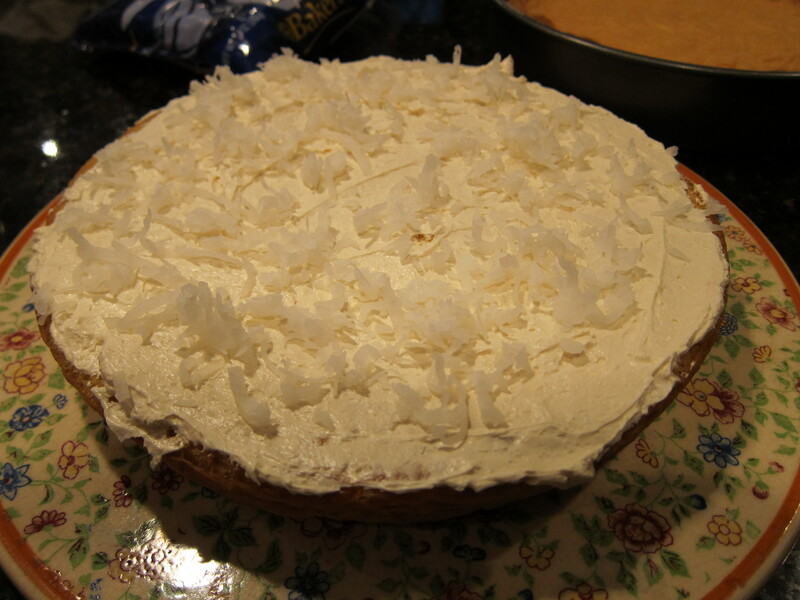 I added a extra layer of sweetened, shredded coconuts before topping with the next layer. This process is repeated twice with the remaining two layers. The cake is then frosted all over. 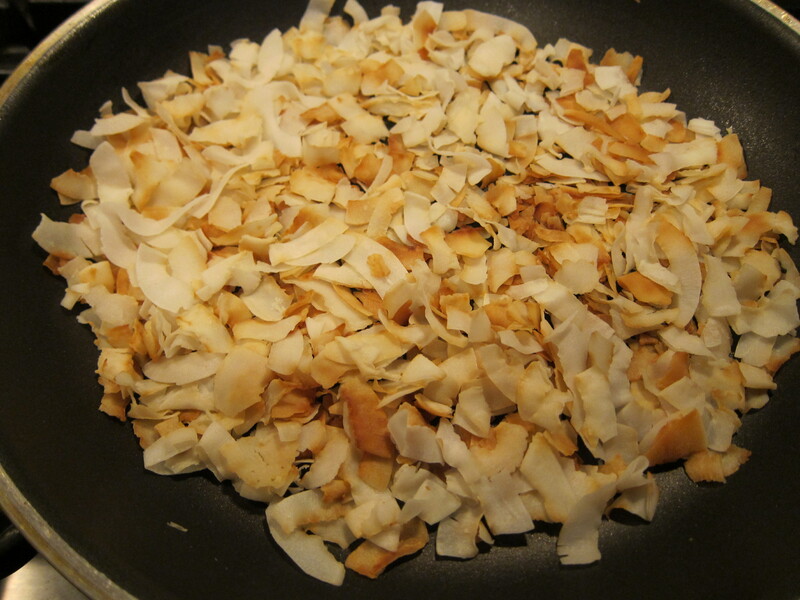 To add finish decorating the cake, I toasted up some unsweetened, large flakes of dried coconut in a pan. Then I pressed the flakes by hand into the frosting on the side of the cake. When I served the cake, I noticed that I did not evenly frost each layer, so there was too much frosting on the top layer, and not enough on the bottom layer. I think next time, I will divide the frosting up so I will know exactly how much frosting I use on each layer. That way the cake will be much more pleasant looking, and the frosting evenly distributed. I love making cakes. It’s like building a house, but on a much much smaller scale. You mix the cement, you lay down the foundations, you erect the framework, and you plaster the walls and shingle the roof top. 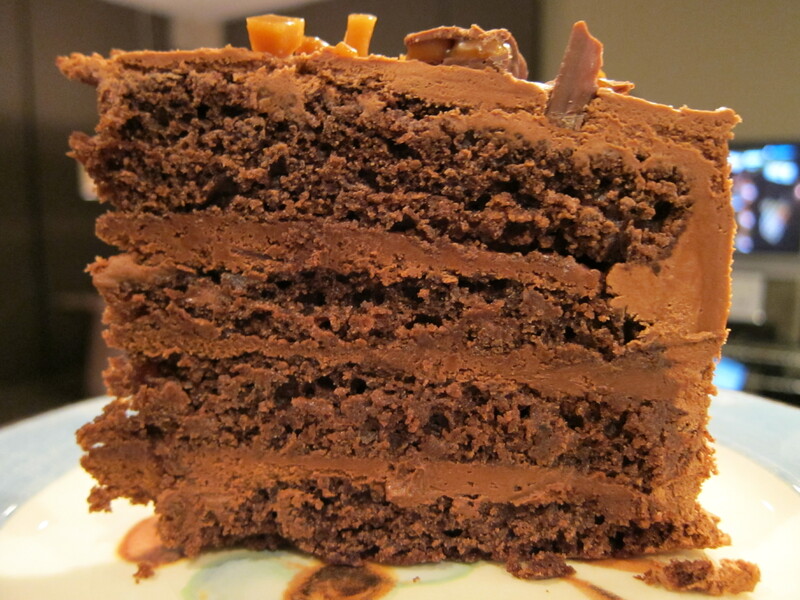 For the dinner party I hosted, I made one of the most chocolaty cakes I’ve ever made before. 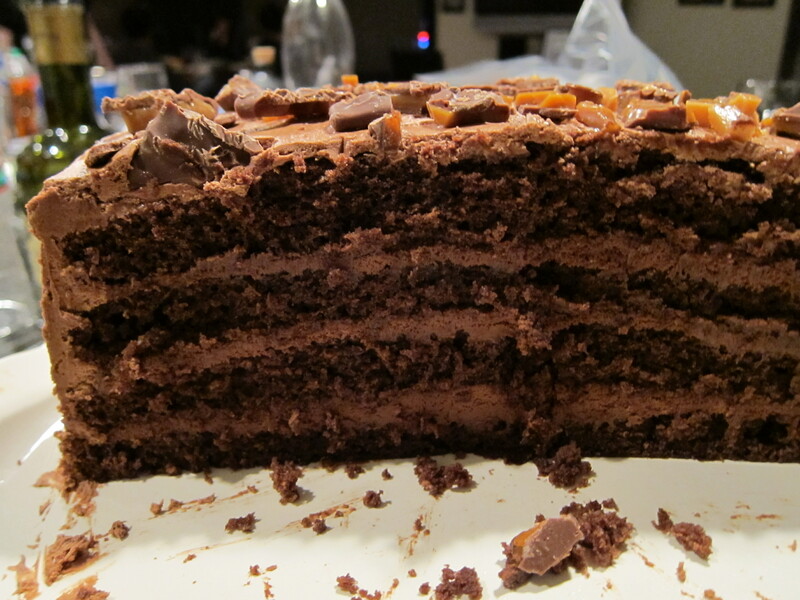 The cake itself has cocoa powder and dark chocolate as ingredients (which makes it the “double” chocolate cake). 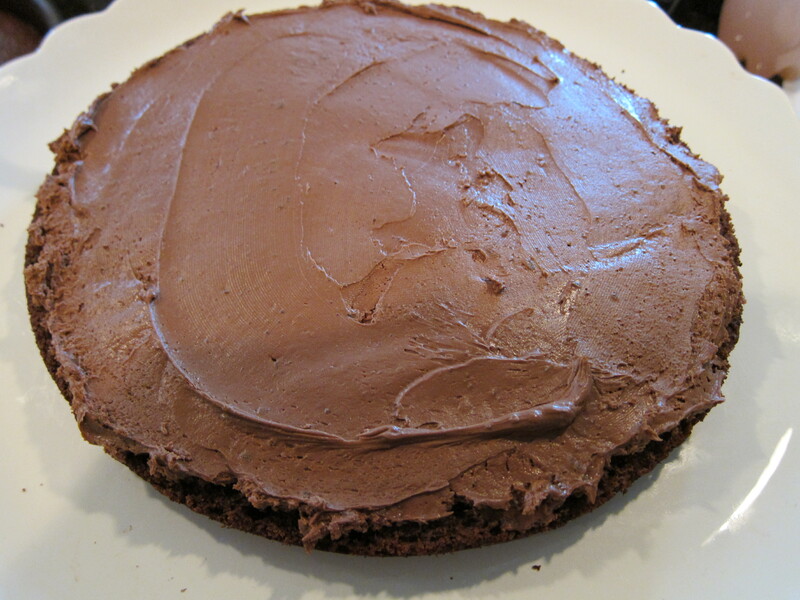 The filling is made out of extra-dark chocolate mousse, and the frosting out of dark chocolate buttercream. I’ve made many cakes before, and this recipe caught my attention because it introduced the idea that the filling of the cake should not be the same as the frosting. I absolutely agree! There are many times a great cake is ruined by the fact that there is just too much frosting. A different filling allows you to take a break from the frosting and throws in a different mix of flavours, although in this case, you can’t get away from the chocolate. 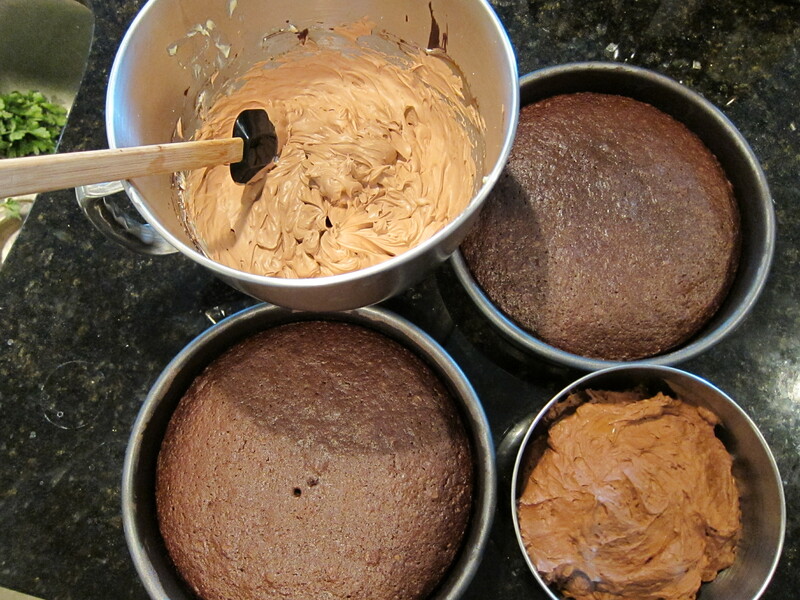 To make the cake, first two 9 inch cake pans are buttered, and lined with cake paper. Most recipes will tell you to use parchment paper for the cake paper, which aids in the removal of the cakes from the pans after baking and cooling. Parchment paper isn’t that expensive, but I found a cheaper, and eco-friendly alternative. I use cut out brown paper bags from grocery stores. I have a ton of these bags laying around, and once in a while, I’ll cut out a stack of 9 inch rounds for my cake pans. It’s free and works perfectly. One thing to note is that you want to place the inked side down so that the side that has no print faces the cake. I’ve had times when the ink would leak and stain the cake, although no one would ever see that once the cake is frosted. After the cake pan is lined, the paper and the sides of the pan is buttered again, and floured (in this case with a mixture of regular flour and cocoa powder). I like to sprinkle some flour in the middle of the pan, and then swirl it around until the bottom is completely coated, then hold the pan at a 90 degree angle, and tap and turn the pan as the side is coated with flour. The pans are set aside until they are ready to use. 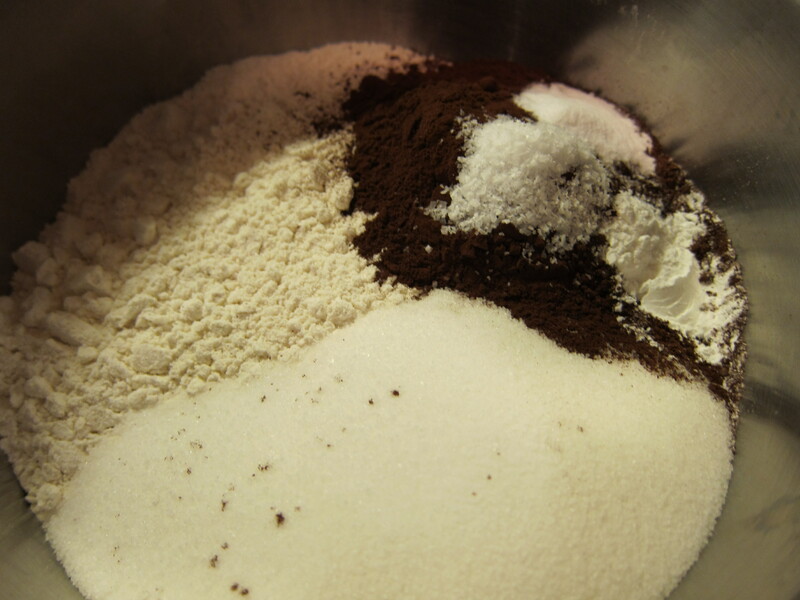 To mix the batter for the cake, you first whisk together the dry ingredients, which includes baking powder, flour, salt, and dutch pressed cocao powder. 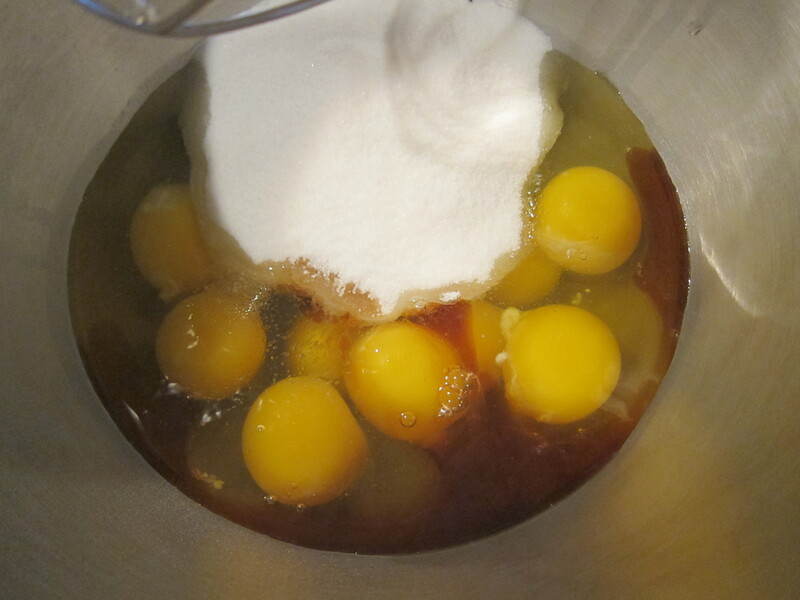 For the wet ingredients, brown sugar, white sugar are beaten together on a stand mixer with eggs until pale and fluffy. Then vegetable oil and melted and cooled bittersweet chocolate is added and beaten in, then buttermilk and vanilla. The dry ingredients are folded gently into the wet ingredients, and the batter is ready to be used. The cakes are baked in the oven and cooled on racks. I set these aside until I was ready to assemble the rest of the cake. 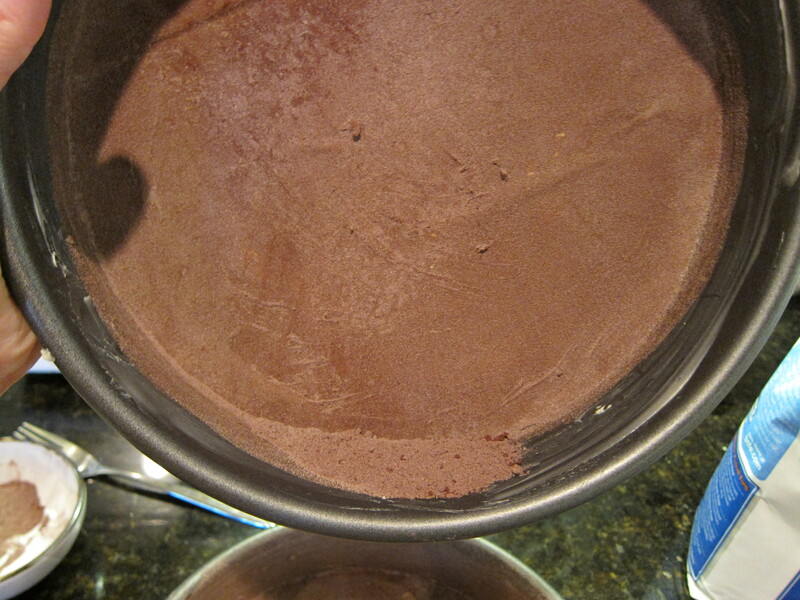 To make the delicious dark chocolate mousse filling, eggs and sugar are beaten until pale and fluffy. 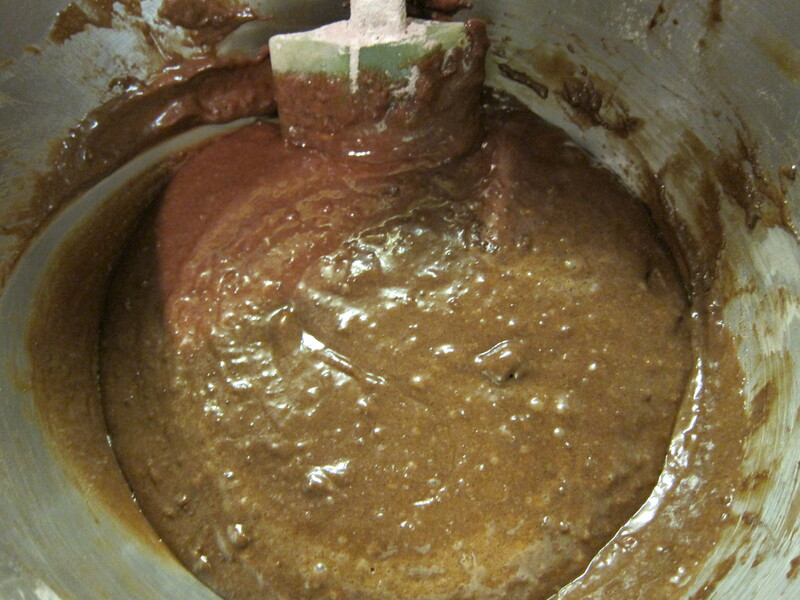 Then extra bittersweet chocolate that has been melted and cooled is added to the mixture. 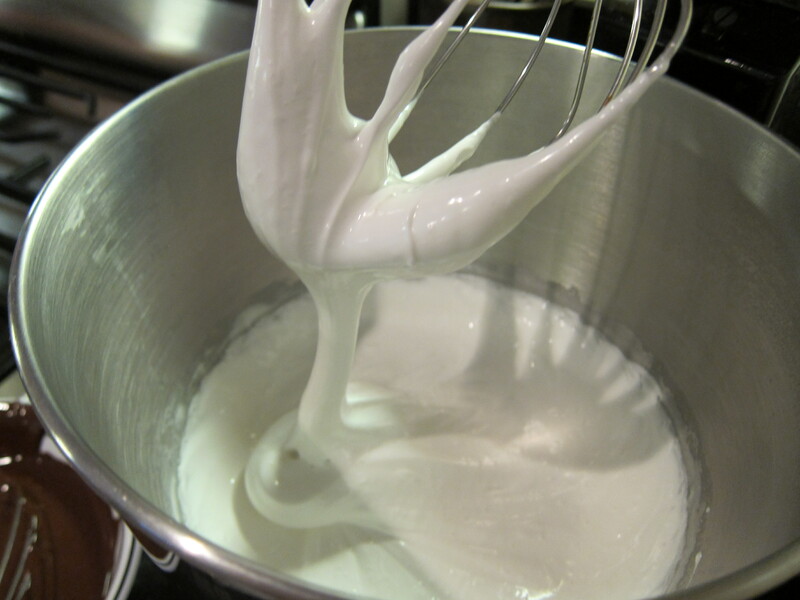 Once thoroughly mixed, some homemade whipped cream is folded in gently in two parts. Please note that folding does not mean stirring. There are many video instructions online about how to fold in whipped cream, and I suggest checking these out if you are unsure what “folding” means. It’s a necessary skill to have for baking, and detrimental to the success of many different cakes, fillings, desserts in general. And it’s not as hard as some may think, just takes a bit of practice and common sense. 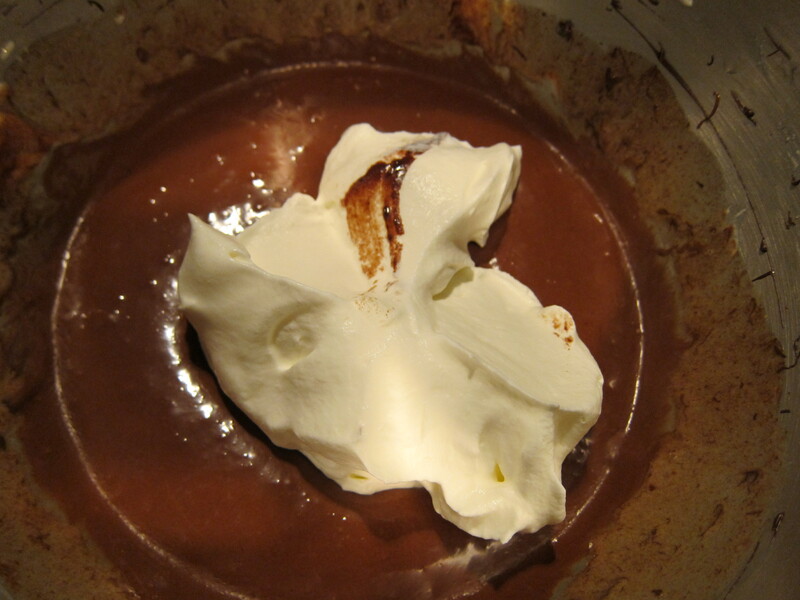 The finished mousse should have a consistency that is like whipped cream but slightly heavier. You can eat this as is or use it in the cake. Please note that if you do keep the mousse in the fridge as you work on the rest of the cake, that it will harden slightly, and you probably want to take it out of the fridge 10 or 20 minutes before you assemble the cake, or it will be a little hard to spread. 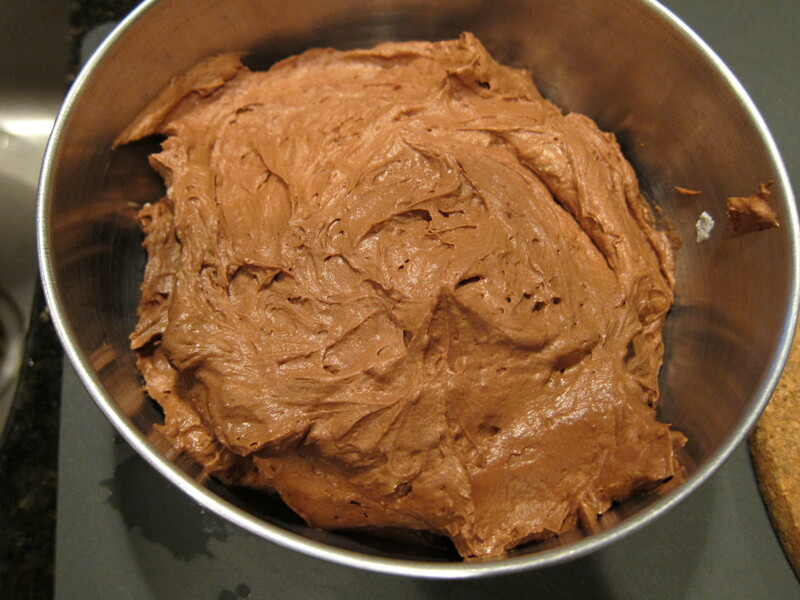 To make the chocolate buttercream frosting, some egg-whites and sugar are whisked in a metal container over a simmering pot of water until the sugar is completely dissolved, then the mixture is beaten until stiff and glossy. Then, while the mixer is running at medium high speed, room temperature butter is added, a few tablespoons at a time, into the mixture, thoroughly incorporated before adding the next pieces of butter. 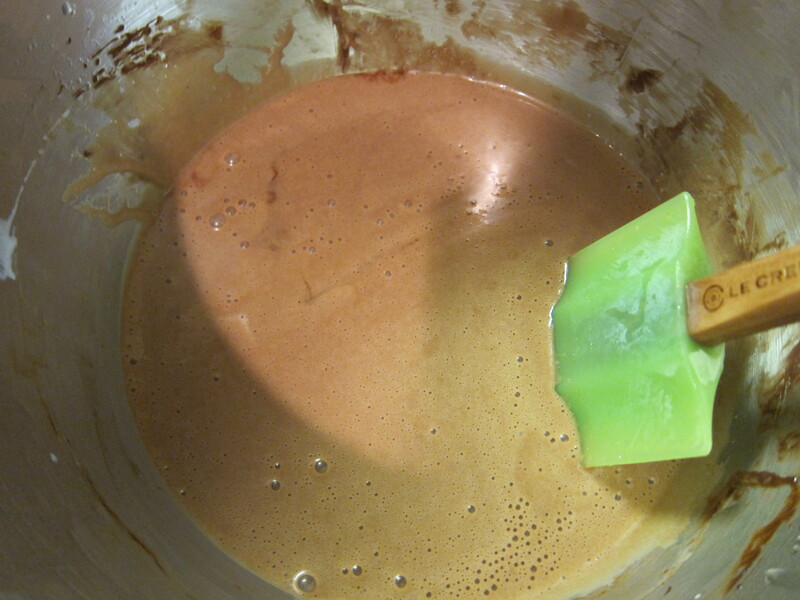 The melted and cooled chocolate is added to this mixture once all the butter has been beaten in. At this point, you will be ready to assemble the cake! I like my cakes nice and tall, so I halved each layer of cake to two, and my cake will have 4 layers of cake, and 3 layers of mousse in all. 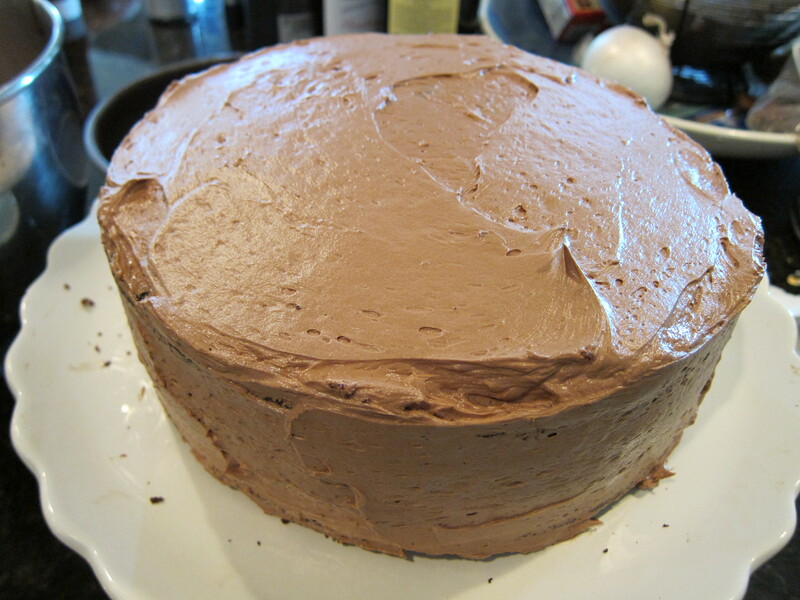 I first spread a layer of chocolate mousse filling on one layer of cake, then top with the next, and the process is repeated until the top layer. Then I finished off the cake by frosting the whole thing with the buttercream frosting. The recipe tells you to cover the cake with a very very thin layer of frosting first, then refrigerating the cake for 10 minutes before proceeding with the completion of the frosting. This will ensure that your frosting does not have any crumbs in it. I topped my cake with some salted caramel pieces and crushed chocolate toffee, as if there wasn’t enough chocolate already. 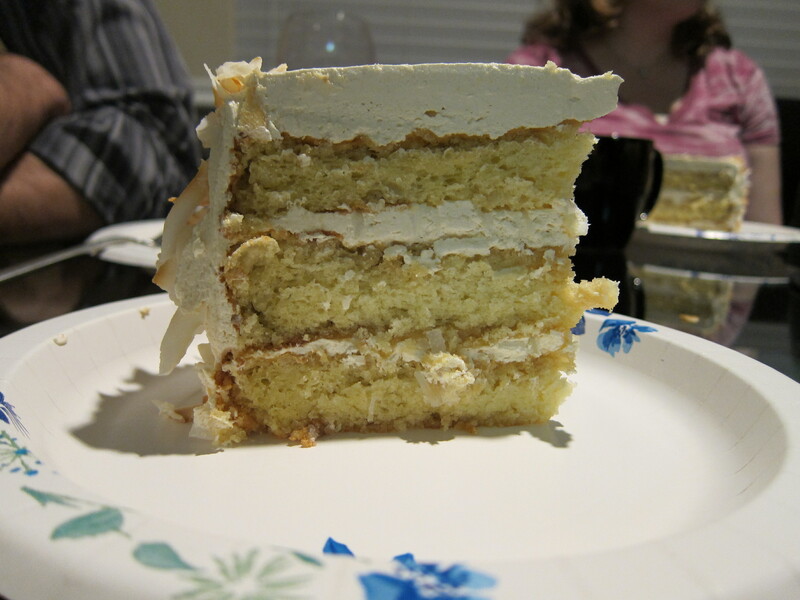 When I slice into my cake, I can see that all four layers are even, and my frosting is pretty even. This is something I try to perfect since the structural integrity of the cake is dependent on it, and visually it looks good.